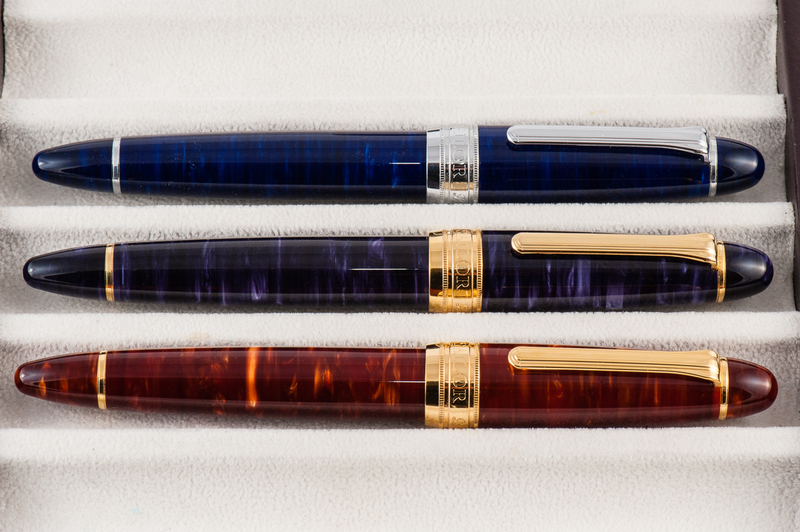 HOTP Editorial: Please note that the Classic Pens LB5 were limited edition releases from 2012 and since then has been unavailable for sale from their authorized retailers. 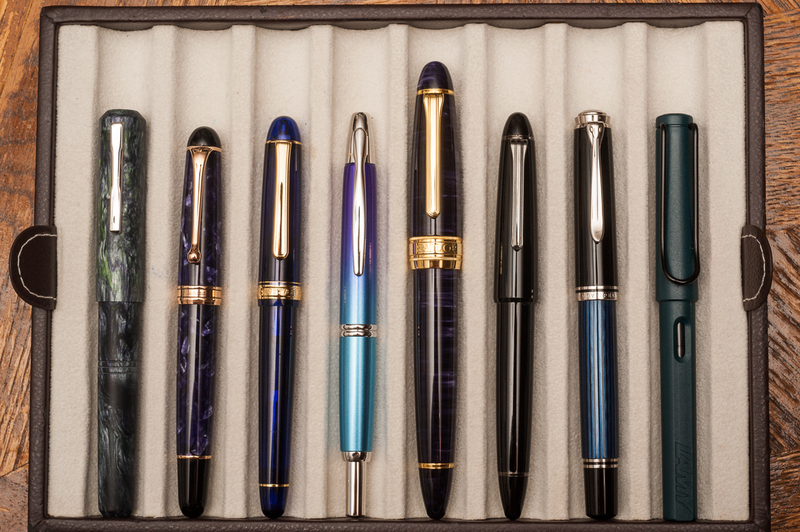 The LB5 pen can occasionally be found for sale in the secondary market, or at a pen show. 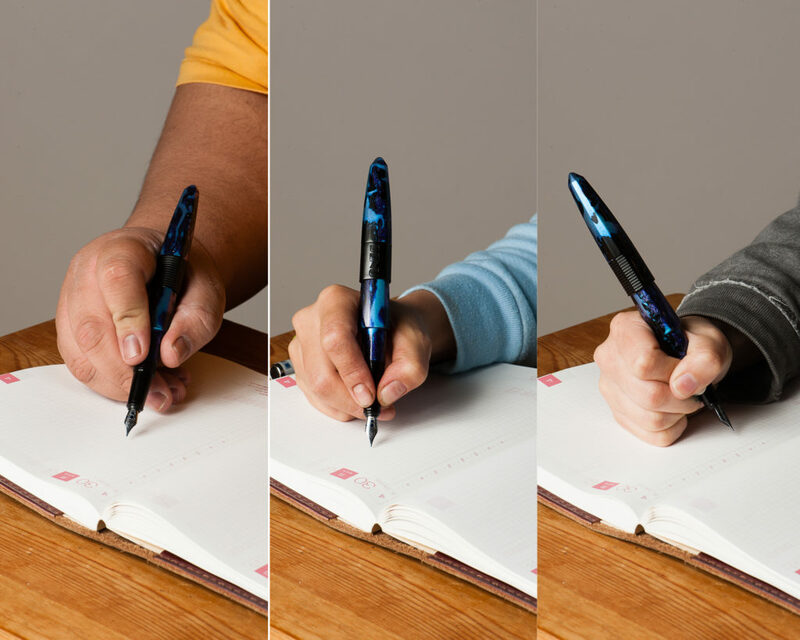 Granted that because this is a limited edition pen, this may only happen a few times and far in between. 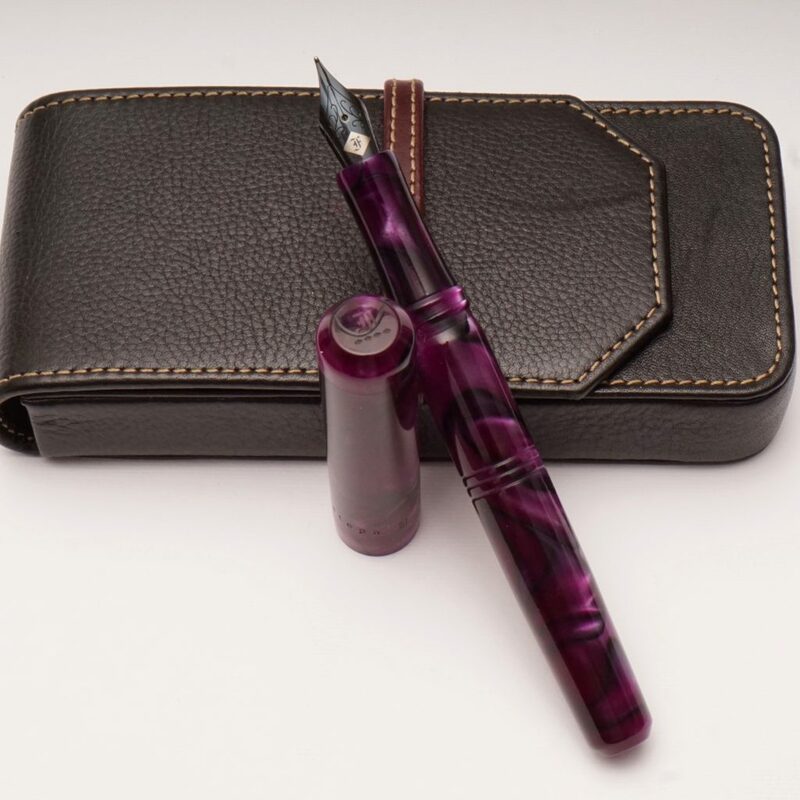 This review, and our pen blog is primarily focused on providing a point-of-view (or is it a grip-of-view?) 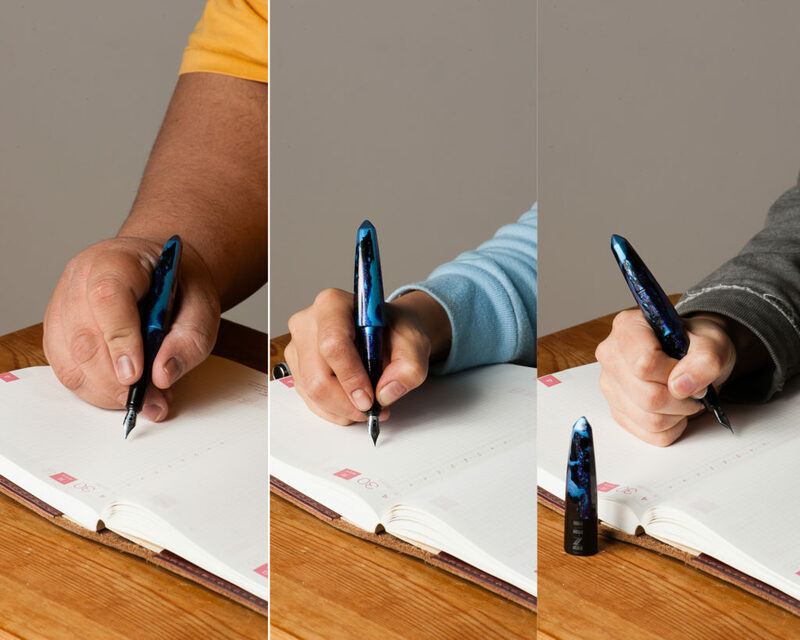 from different hand sizes as well as compare the LB5’s size against other more common pens. Thank you for reading our thoughts and reviews! 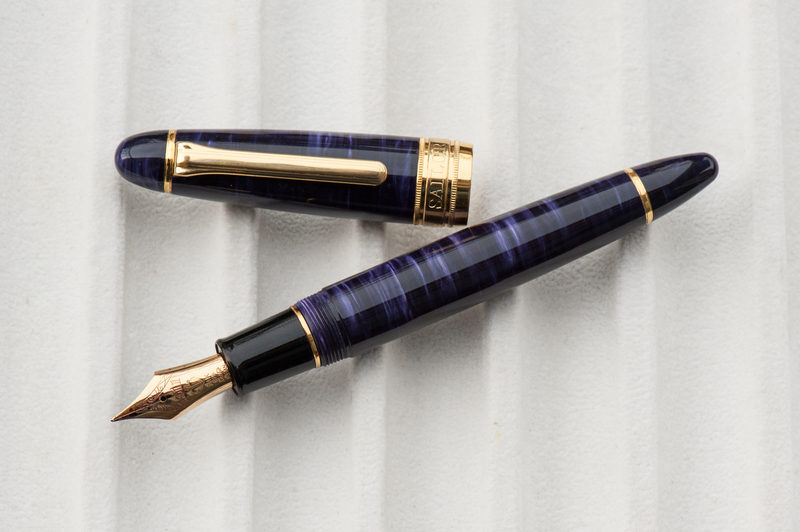 Katherine: This is a very sizable pen made out of a very unique and interesting material. 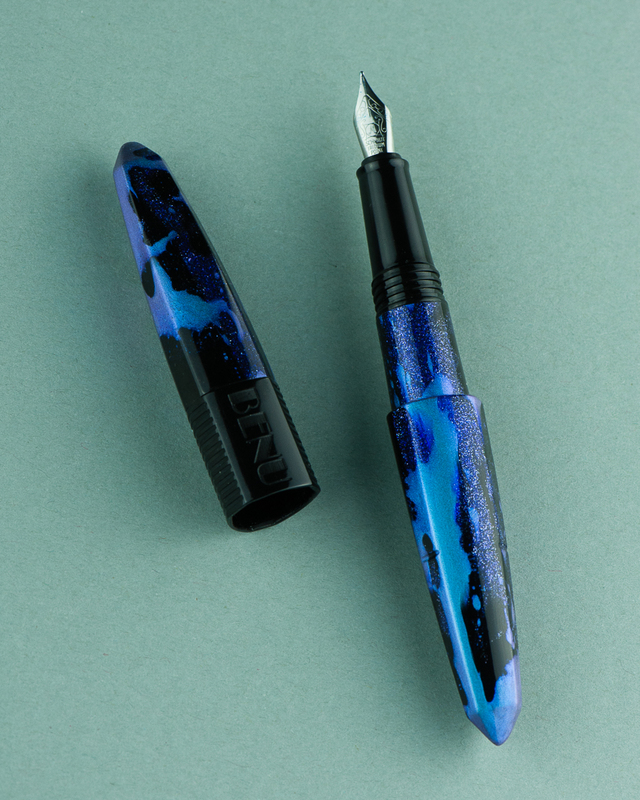 The something or another fancy acrylic has a lot of depth, in a way that is totally unique from celluloid or other acrylics. 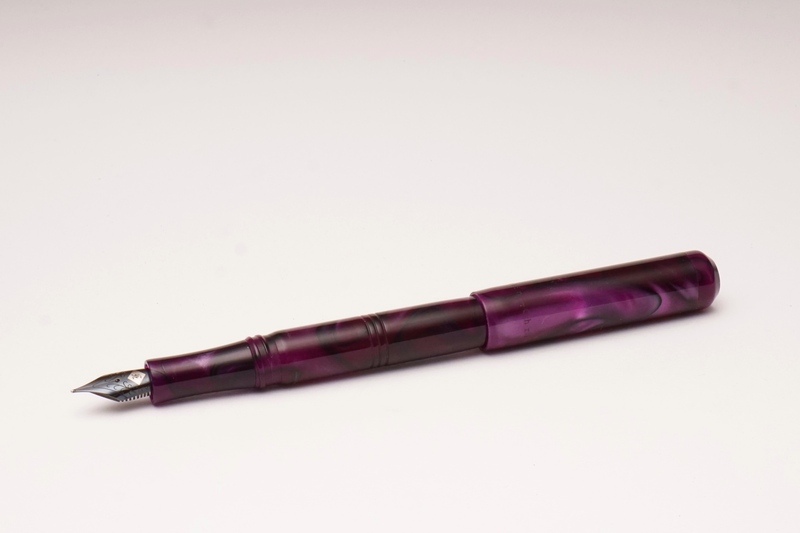 I really like how this pen looks — I just wish it were smaller. Pam: Holy nightstick Batman! That’s how big this pen is (at least to me). 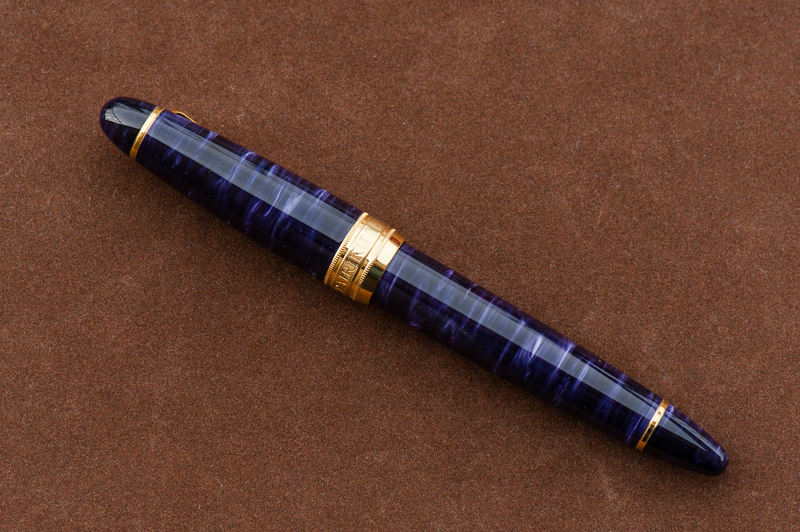 It’s one of the most notable features of the pen. The second thing that I noticed of this massive beauty is the material. 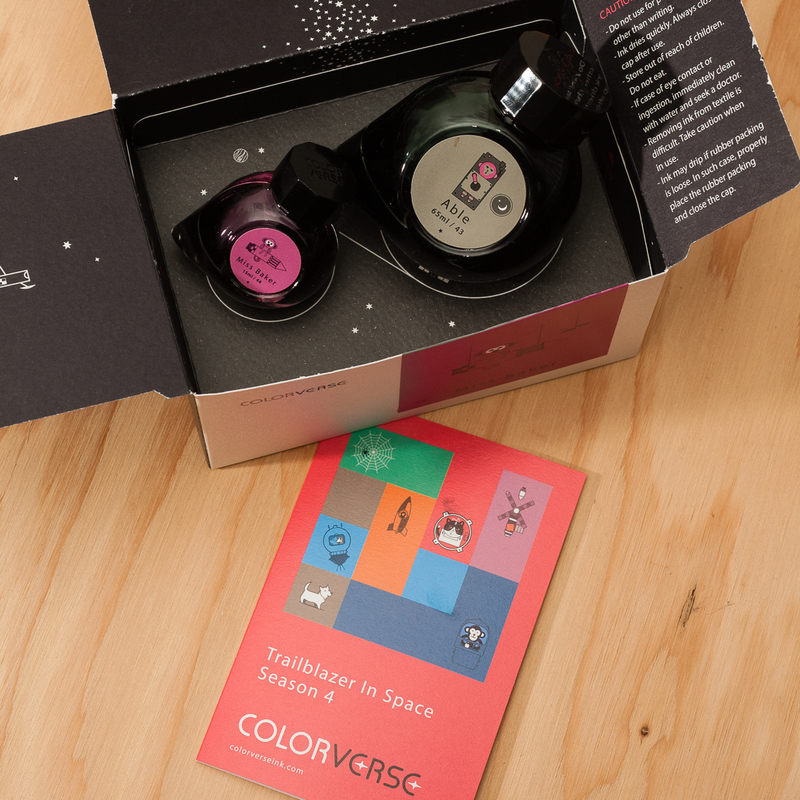 The material has a lot of surface area to show off it’s depth and iridescence. 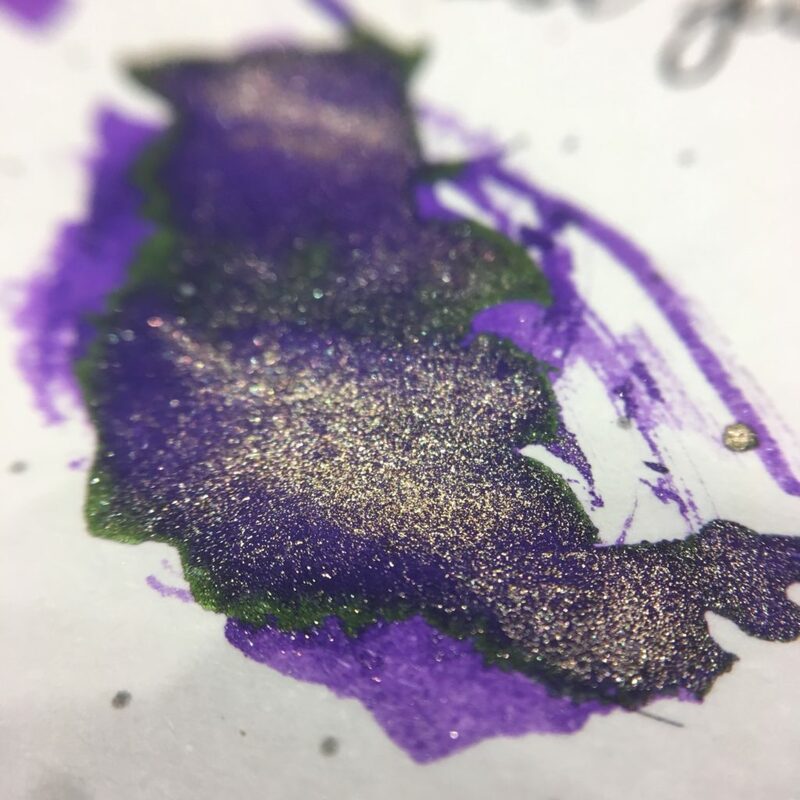 Pictures can’t do this pen justice. One of my favorite materials of the LB 5 is the purple. 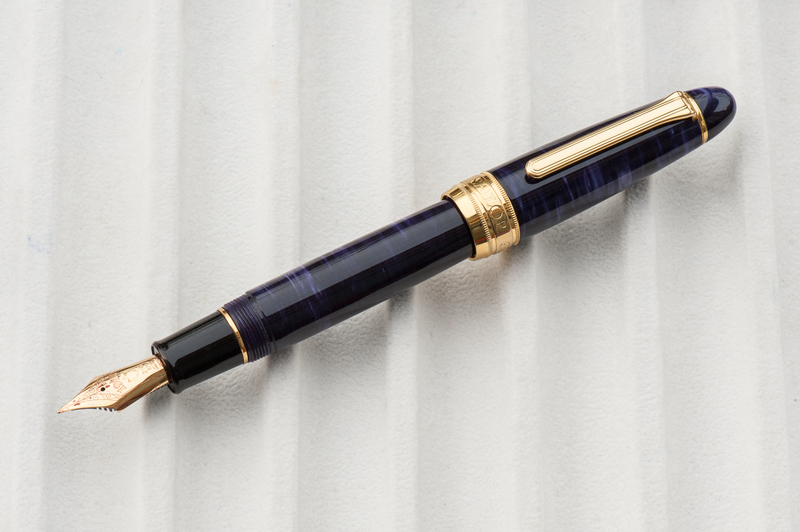 The overall aesthetic of the pen is very much a classic shape with the traditional gold trim. 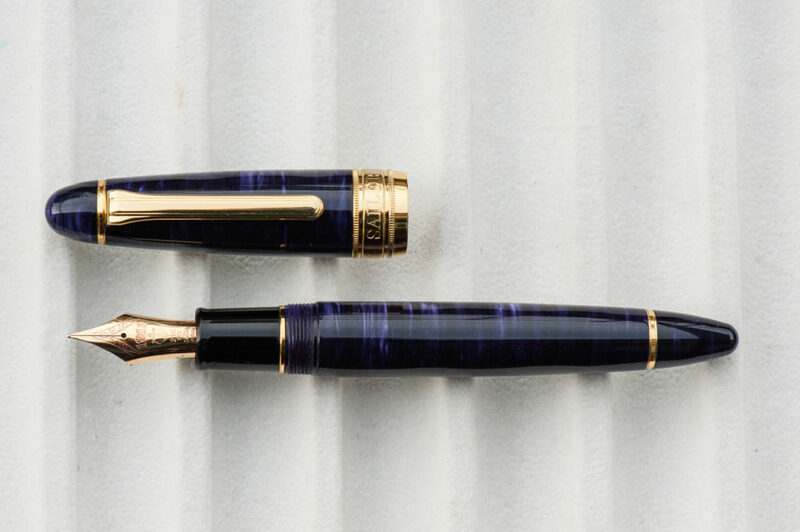 However, maybe it’s the size or the material, but I wouldn’t consider the aesthetic of the pen to be “vintage” looking. Franz: CHATOYANCE! Pardon my French. 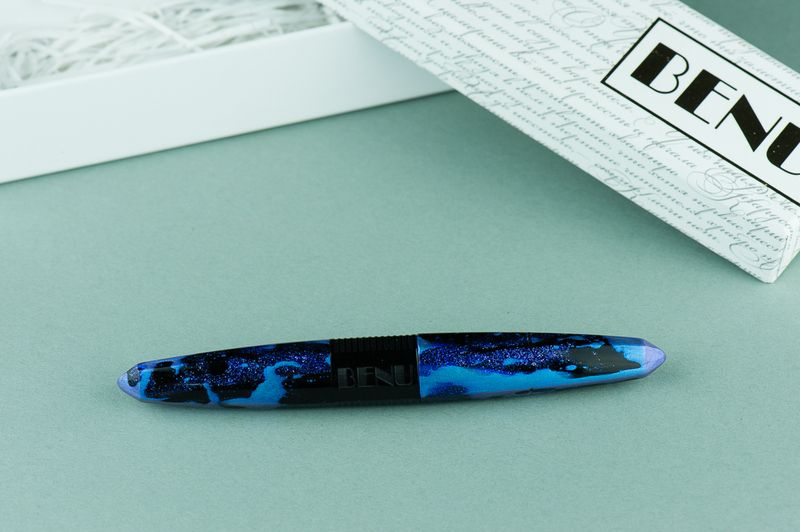 An over-sized pen with a beautiful acrylic material? Please tell me more! 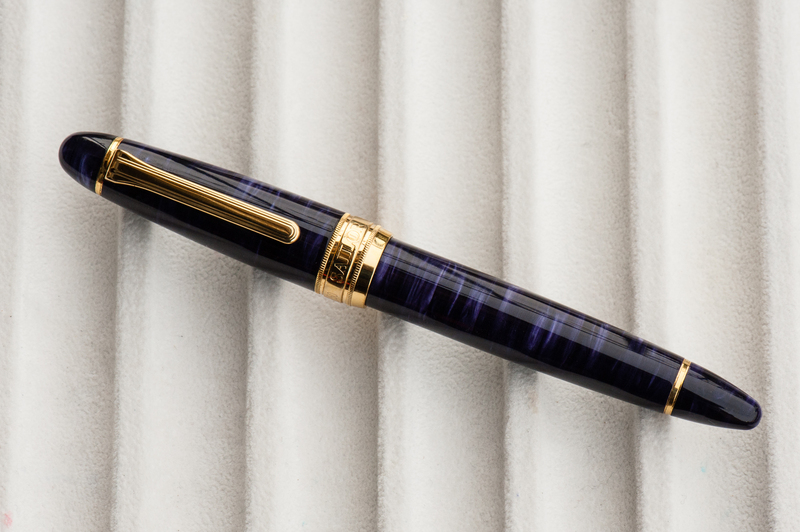 The Classic Pens LB5 is an impressive pen to behold. 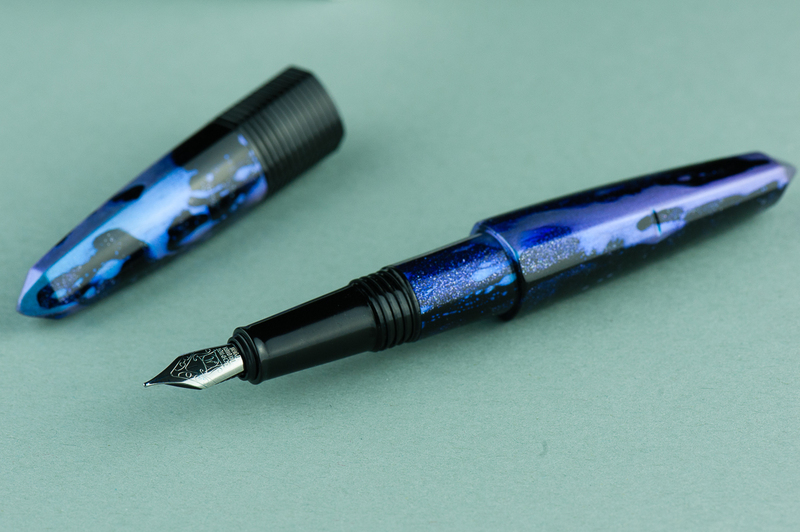 Their unique material lures you in and the Sailor King of Pen nib performance keeps you coming back for more. As the blog photographer for HOTP, I tried my very best to show the beauty of the LB5’s material but nothing beats seeing it in person. 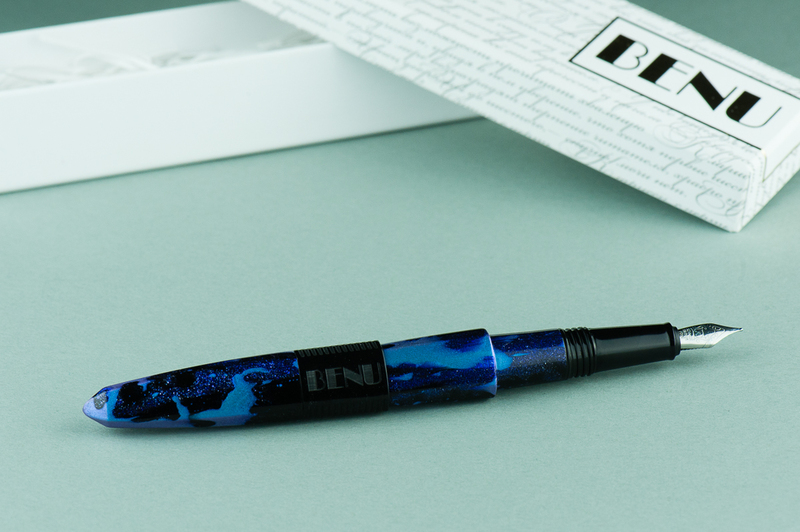 Background Info: Classic Pens was established in 1987 and has been known for collaborating with other pen brands, and artists to introduce stunning limited edition art pens. 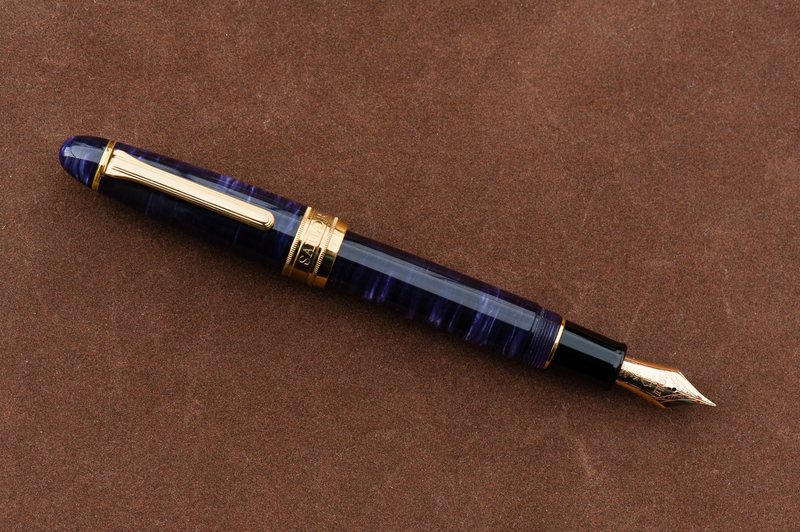 The pen in review is part of the LB Collection wherein LB is an acronym for Lambrou and Brown. 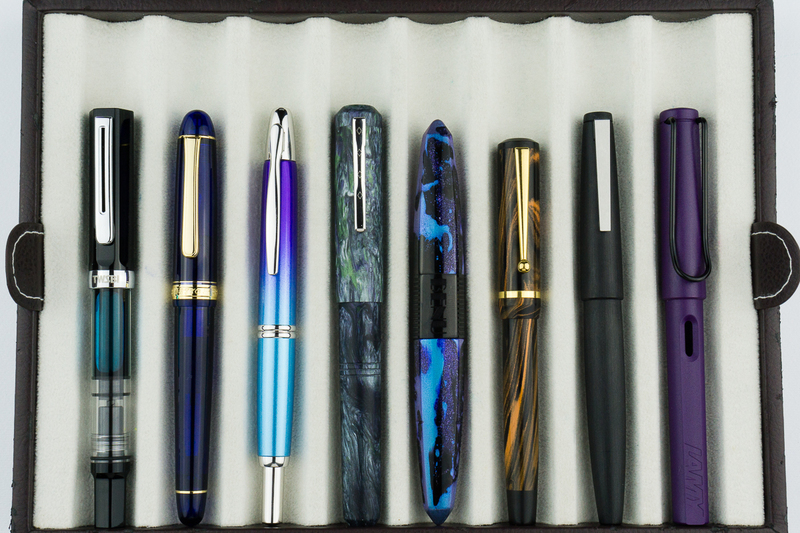 Andreas Lambrou and Keith Brown are the two founders of Classic Pens. 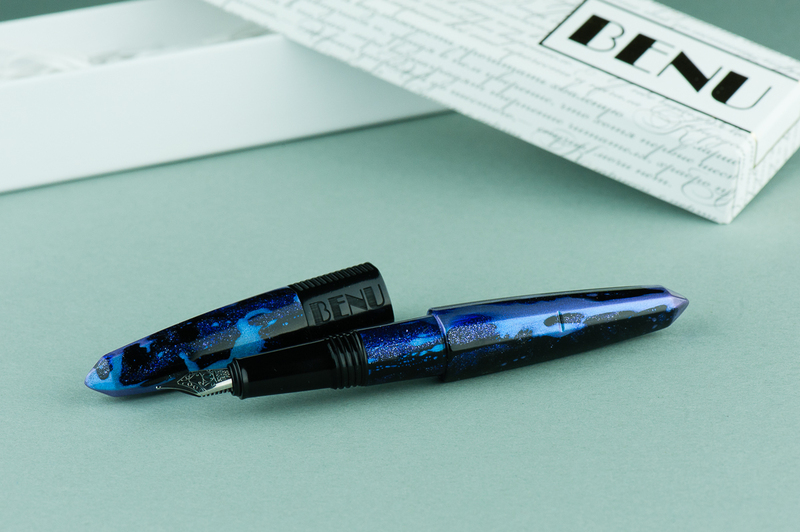 The LB5 series was introduced in 2012 and 2013 to commemorate the company’s 25th year anniversary and was aptly named, Classic Pens LB5 25th Anniversary Shizen (Nature) Pens. 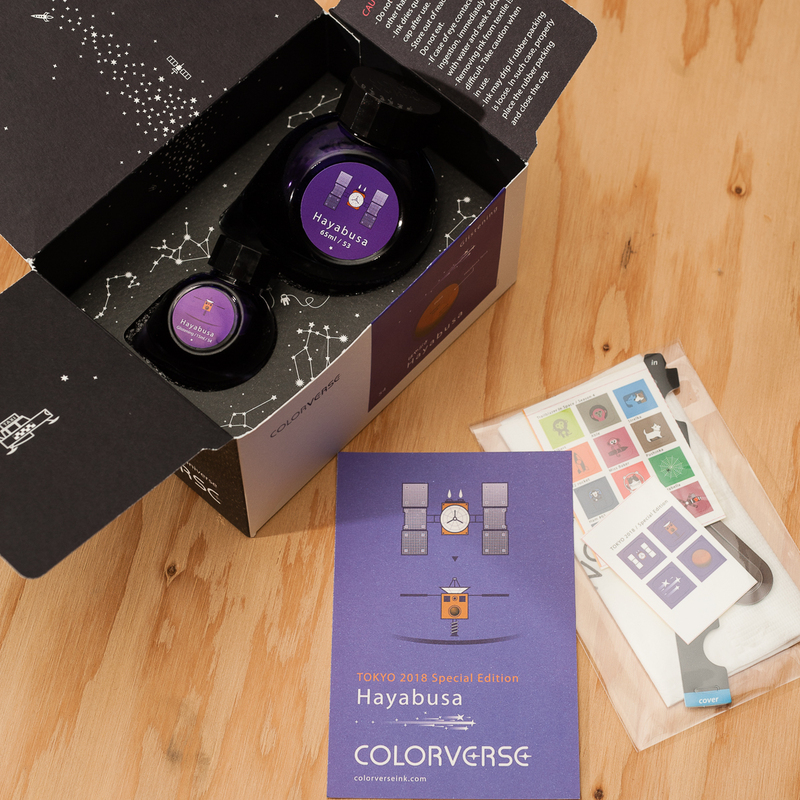 The unique acrylic was made by two companies. 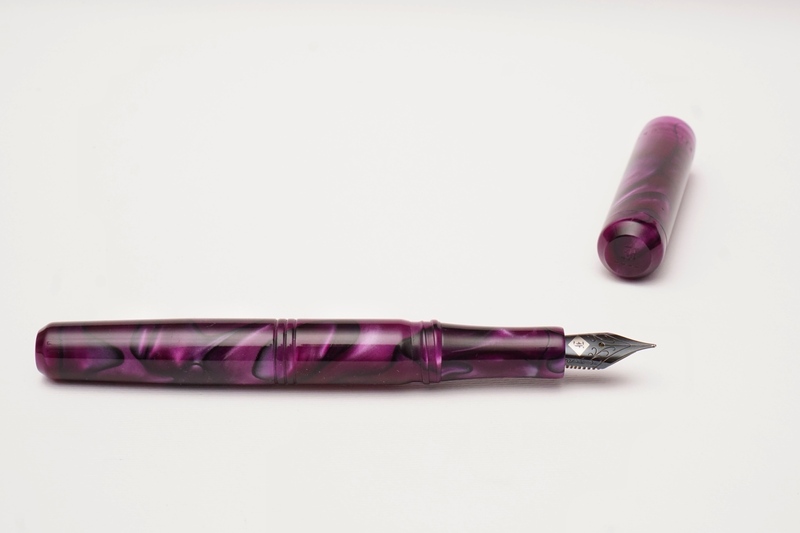 First, Sintetica from Italy cast the sheets of pearlized acrylic and then Carville from the United Kingdom used an exclusive diffusion bonding technique to bond multiple sheets together and made the material more stable. 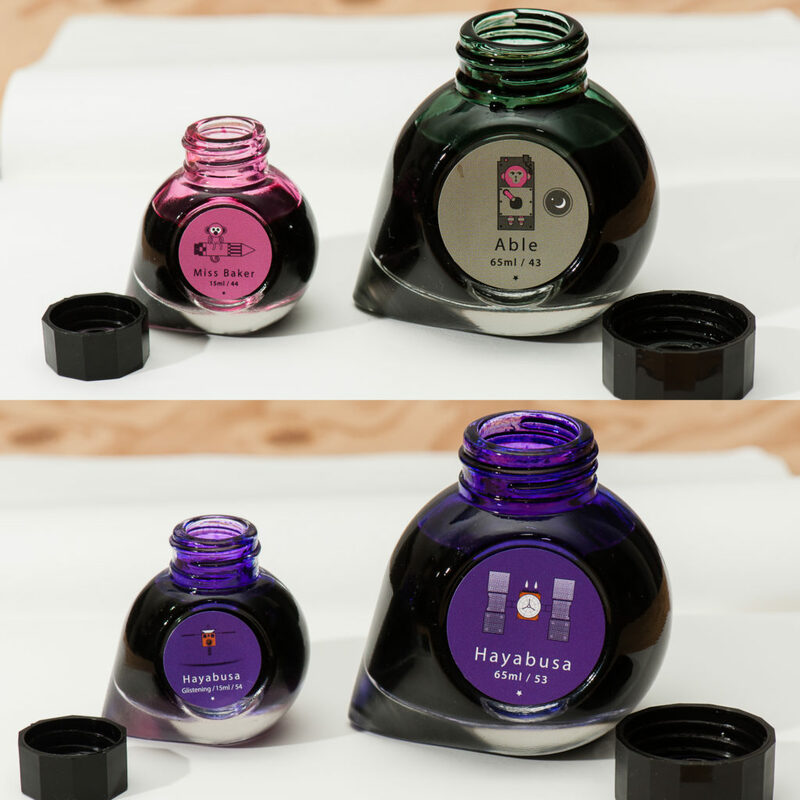 The acrylic was then sent to Sailor Pen Japan to each be turned into a King Profit (King of Pen) pen. 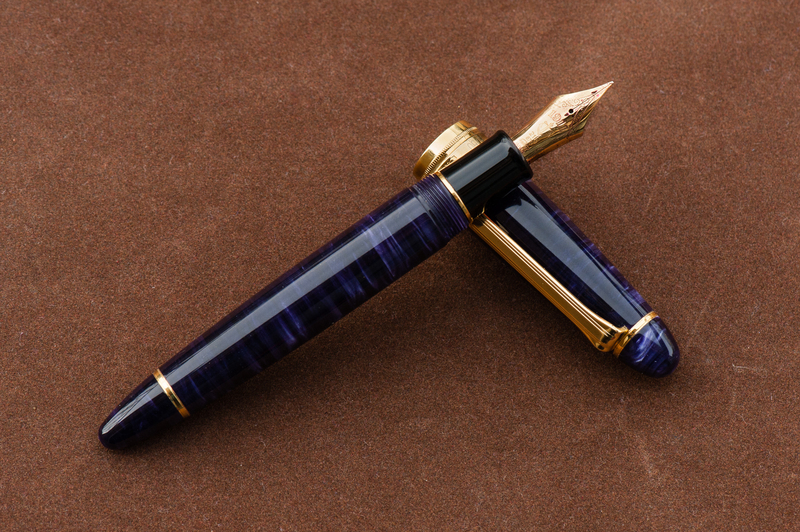 A difference to be noted is that the LB5 was made 5mm longer than the King Profit pen. 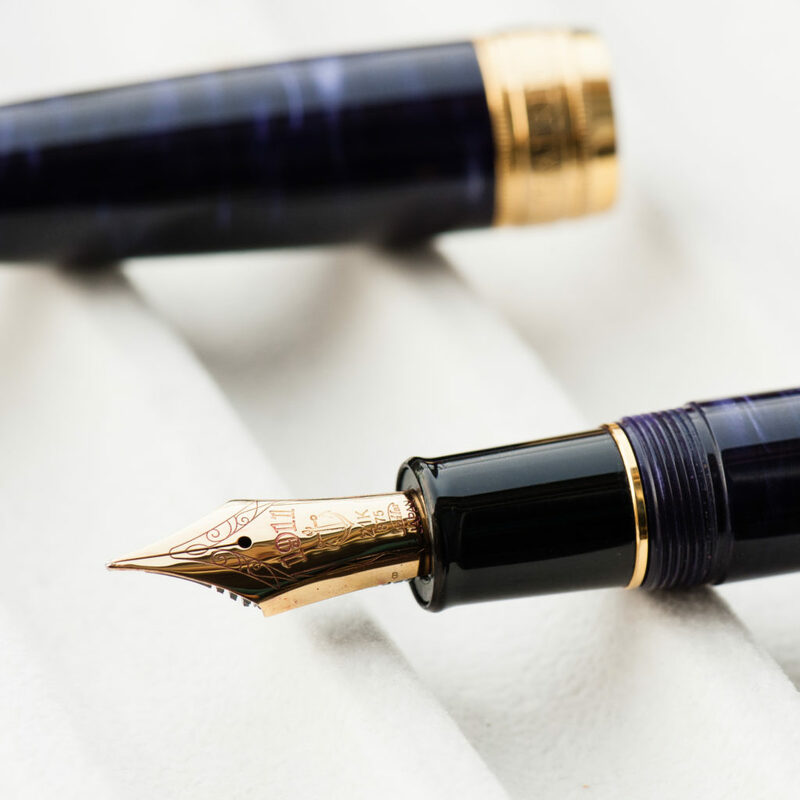 And the pen was fitted with a 21-karat King Profit nib. 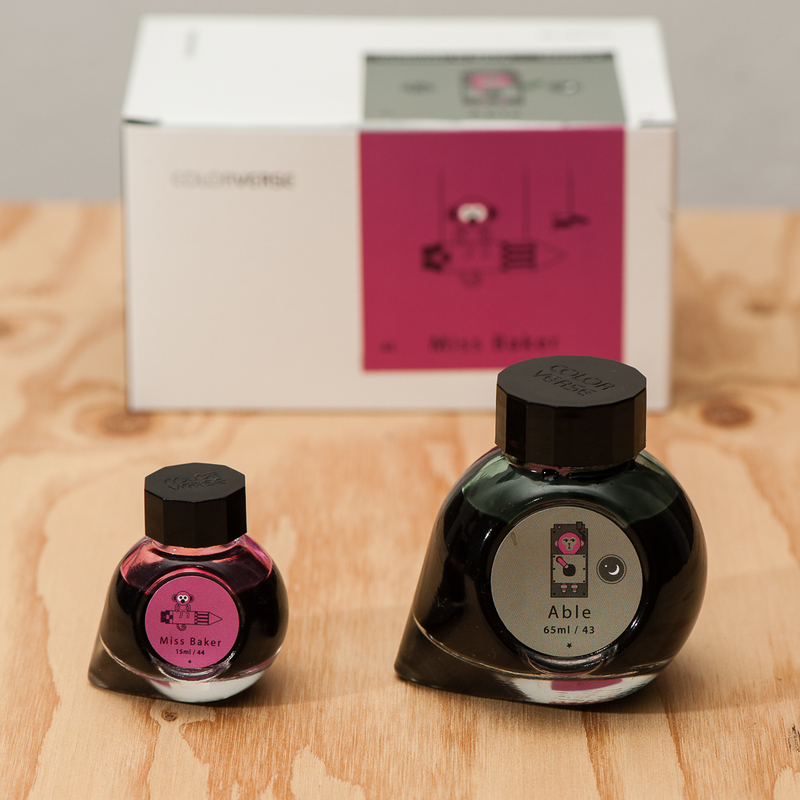 The nib sizes offered were either a medium, or broad. 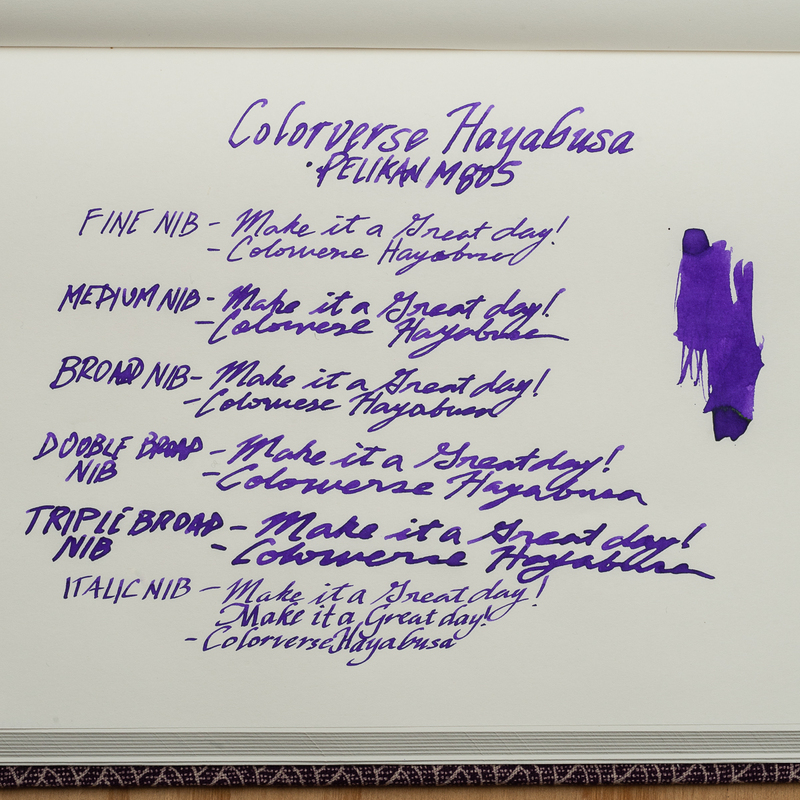 There were a few Nagahara Cross Point nibs available at a premium price. 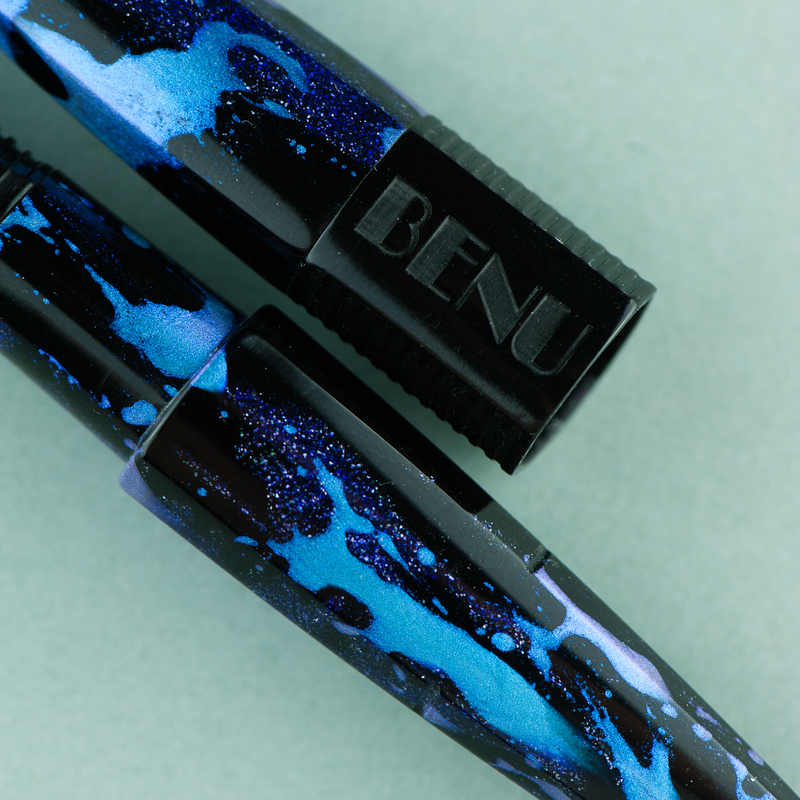 The LB5 was manufactured in six different colors: Tensui (raindrops) in Space Blue, Kaen (violent flames) in Flame Red, Midorigi (new green trees) in Forest Green, Tairiku (continent) in Marble White, Kouseki (metal ore) in Diamond Brown, and Tairiku (continent) in Amethyst Mauve which is the pen we are reviewing. 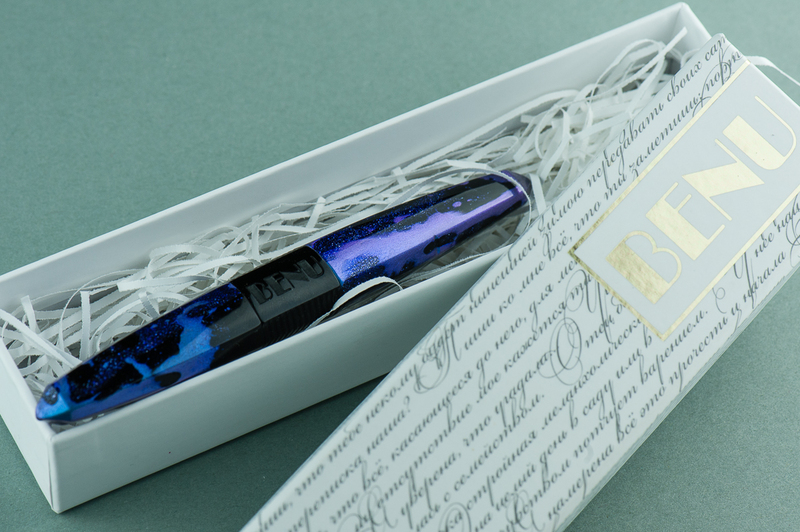 This limited edition was issued only with 50 pens in each color. with a listed price of $1,600 in 2013. 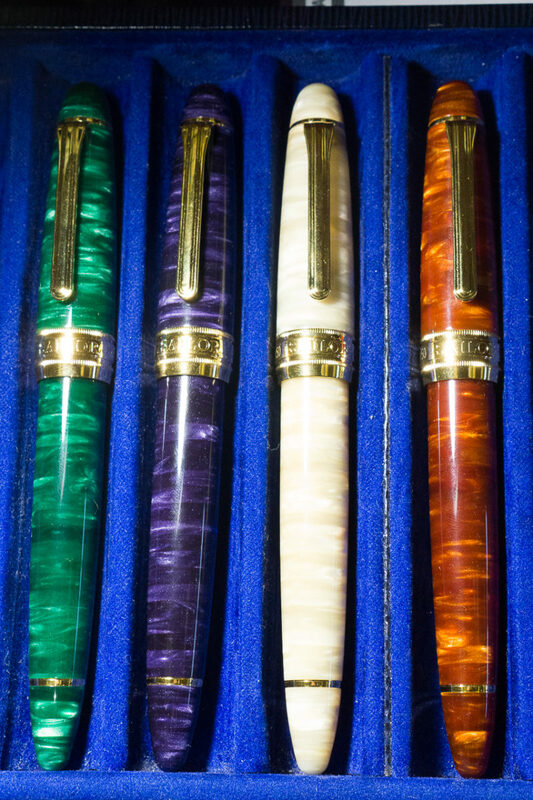 Important to note that in recent years, Classic Pens changed their name into Lambrou Pens. 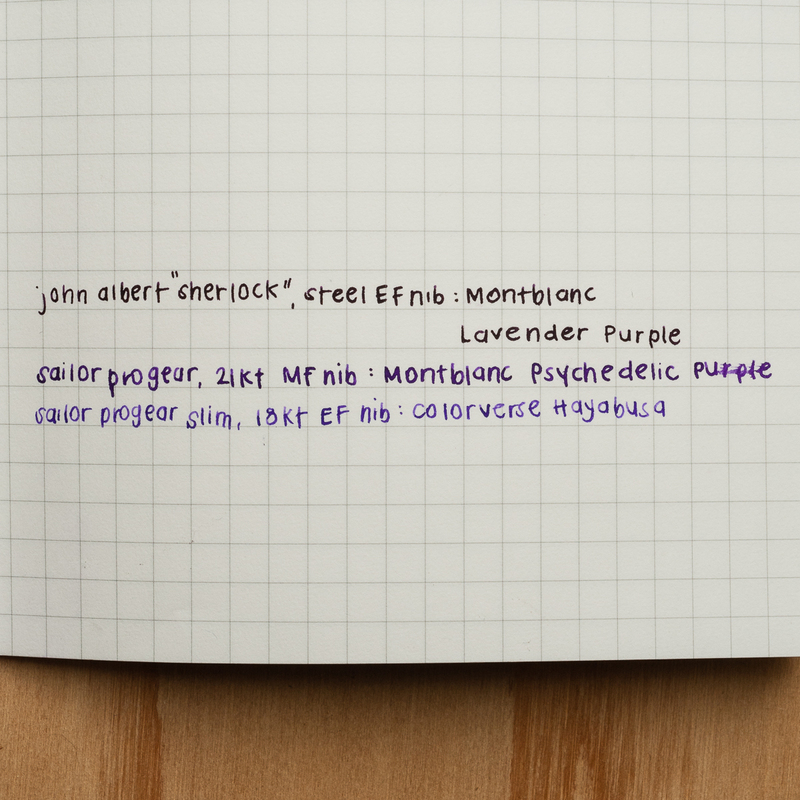 Katherine: I’ve tried LB5s with both an unmodified Medium and a Broad Cursive Italic, both were lovely. 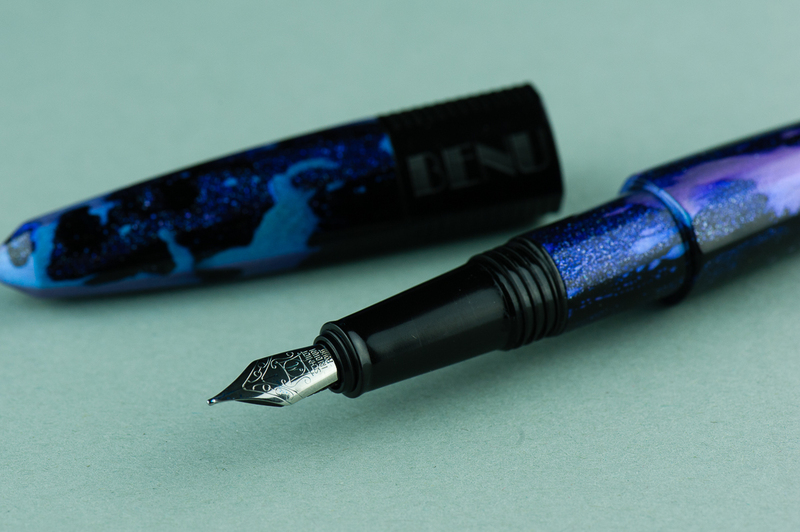 The first time I tried it, I was surprised by how soft and bouncy the nib was. 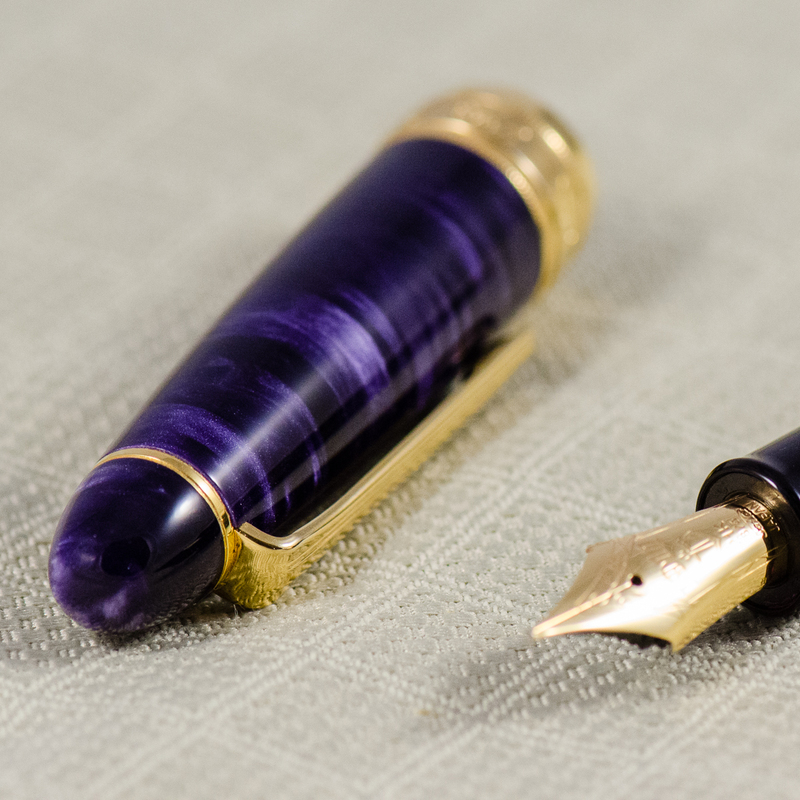 I loved writing with it, though it is a monster of a nib. 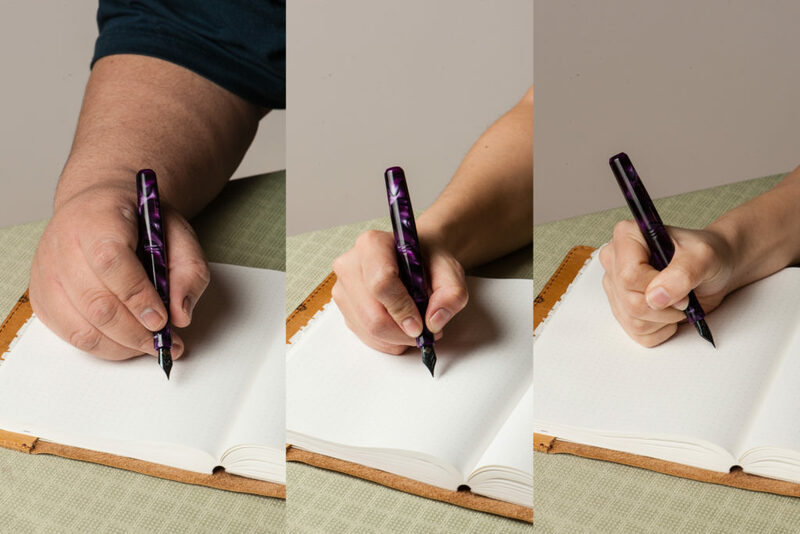 I tend to hold my pens pretty far forward, and the size of this nib means I hold it at the very lip sometimes. Not a problem, but an observation. 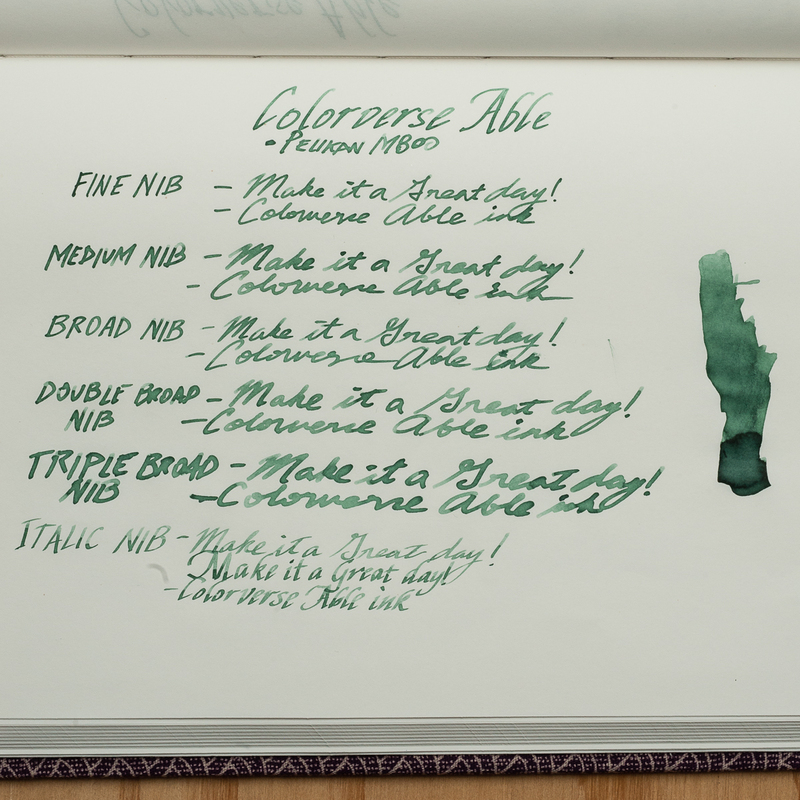 Pam: This nib is a Sailor nib, so it’s perfect. 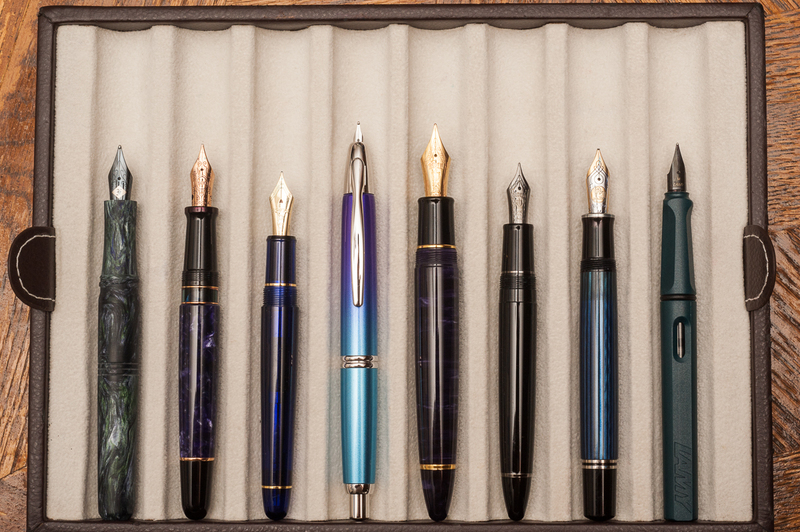 Actually, it’s not the typical size of the Sailor nibs that we know and adore so well. Like the pen, it’s bigger! 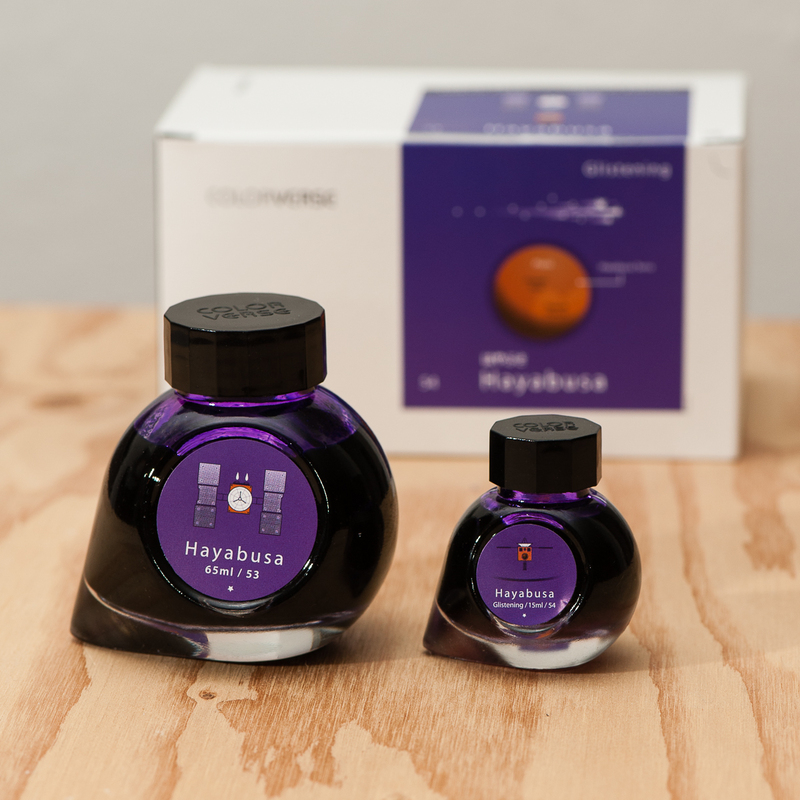 With the extra size and material of the nib, comes with more bounce. 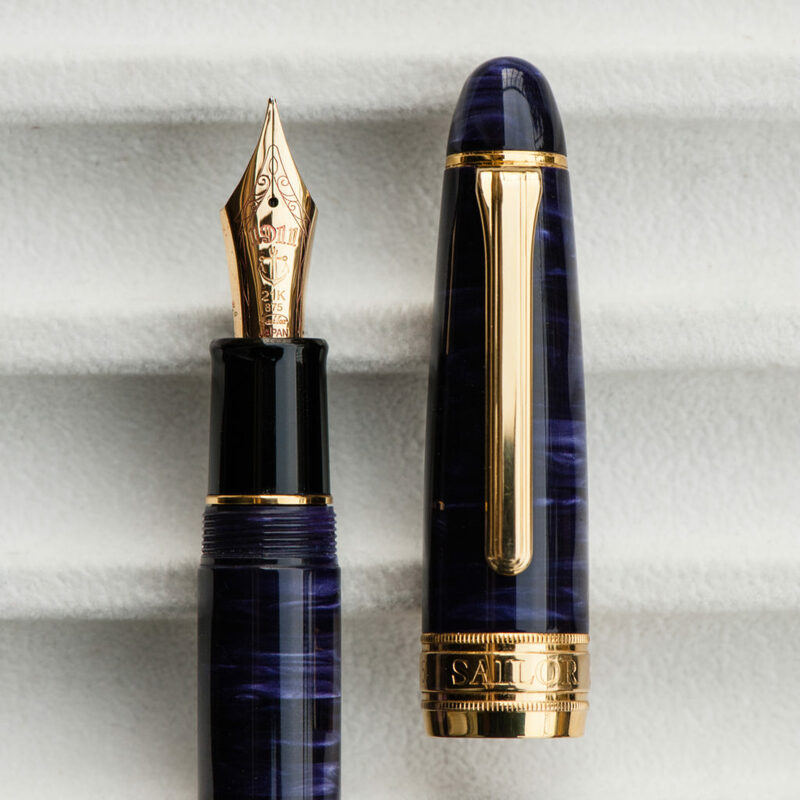 Perhaps, it’s my natural bias to love all things Sailor but I really enjoyed the “oversized” nib with the “oversized” pen. (Oversized is in quotes because I know it’s the perfect size for bear paws.) 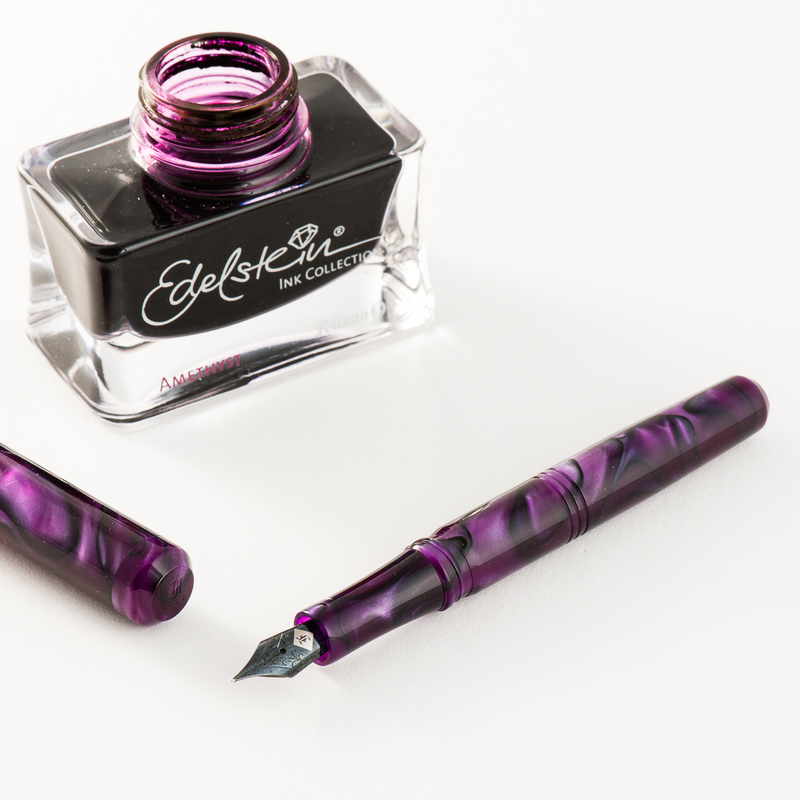 Oddly enough, I felt that this nib was proportional to the pen and performed extremely well. 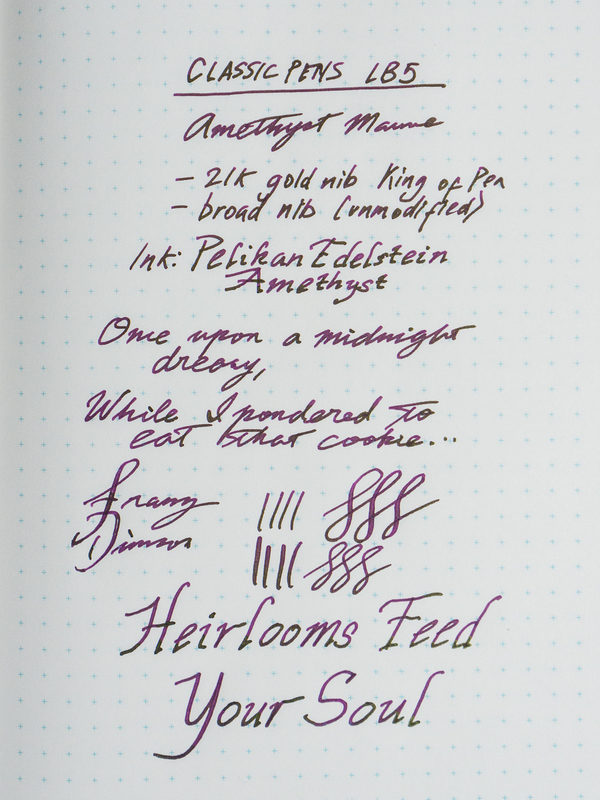 It was a smoother nib than I expected and I didn’t feel the pencil-like feedback that Sailor nibs are known for. 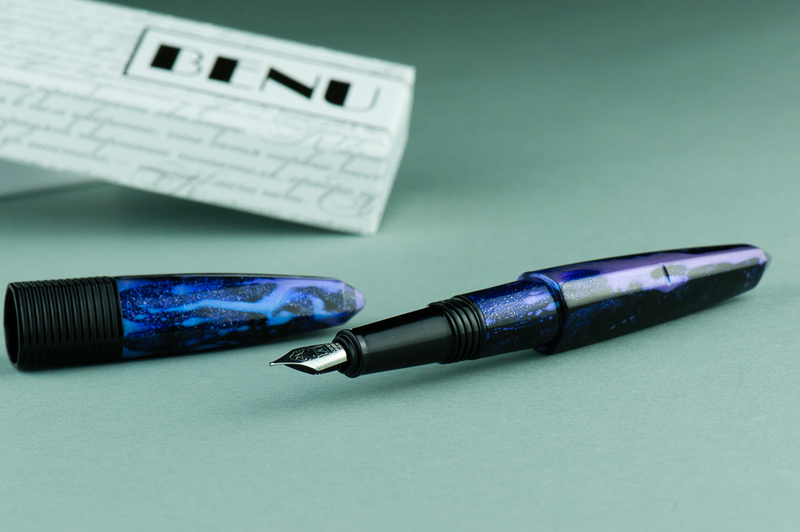 Franz: The LB5 is made by Sailor so naturally, the nib used was their King of Pen line. As Pam mentioned, the size of the KoP nib was balanced against the larger size of the LB5. 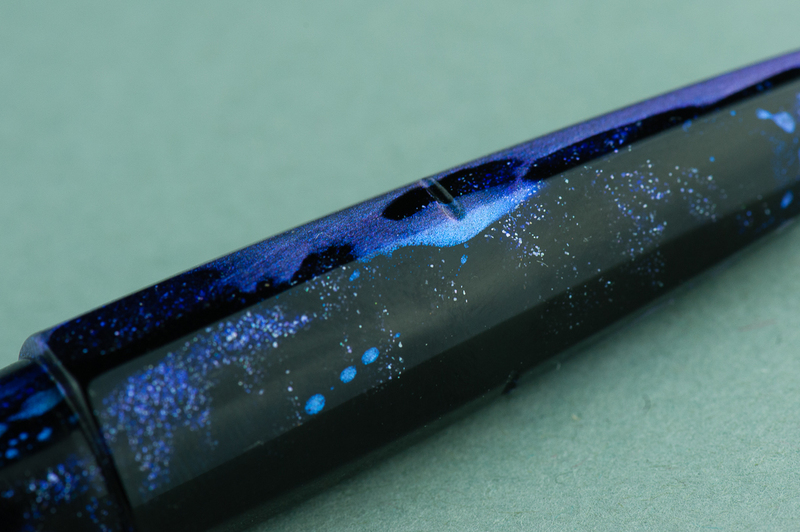 Most Sailor nibs write perfectly out-of-the-box and this was no exception. The unmodified broad nib wrote smoothly and had a bit of bounce to it. 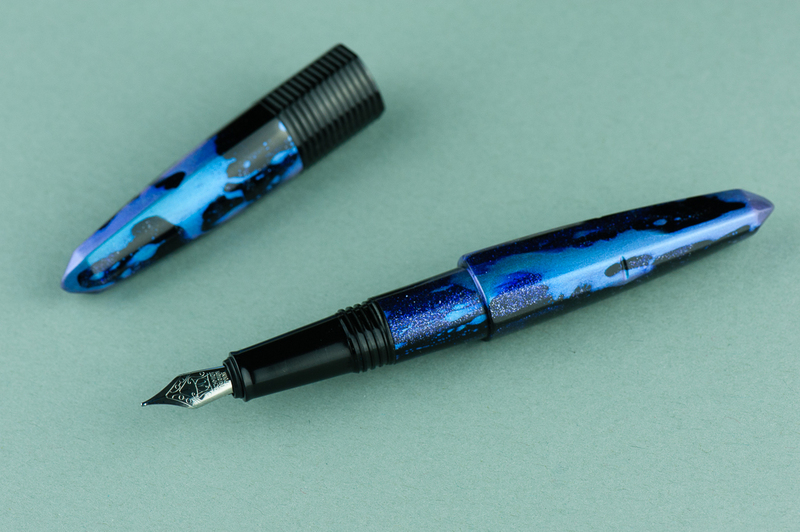 The 21-karat KoP nibs are not meant to be used for flex writing but its springiness provided a little flair to my writing. 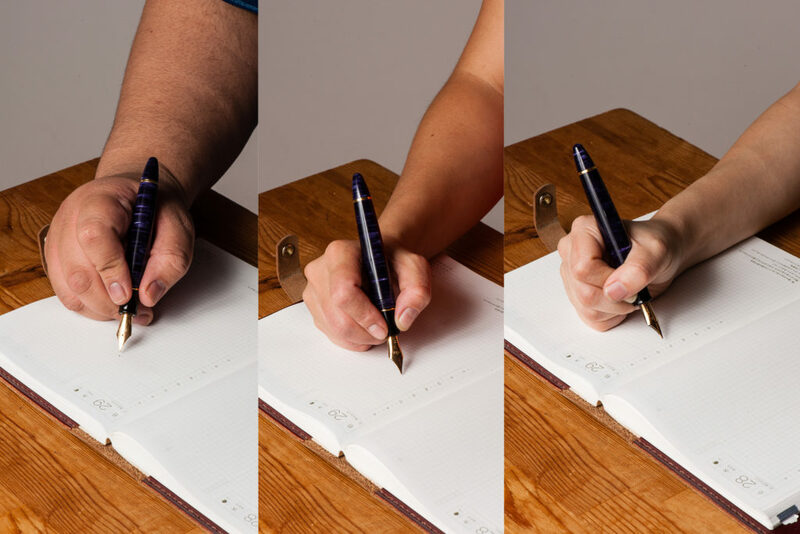 As shown in the second photo below, the LB5 section is comparable to other over-sized pens and was comfortable for my grip. Katherine: This pen is a littttle too large for me. It’s usable, but if I grip it tightly, my hand ends up pretty tired. If I grip it loosely though, it’s great! 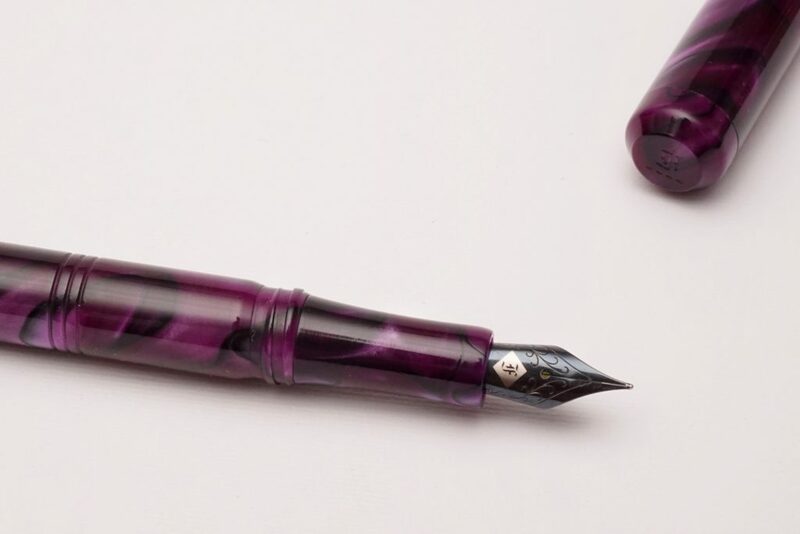 A fun nib in a pen that’s beautiful. 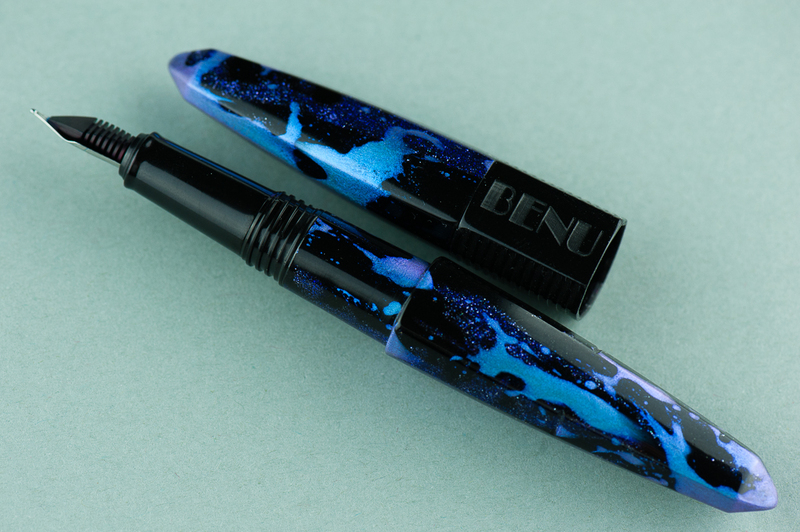 Unfortunately, though, I tend to be a not-loose gripper by default, so I don’t think this pen will ever be a favorite for journaling. 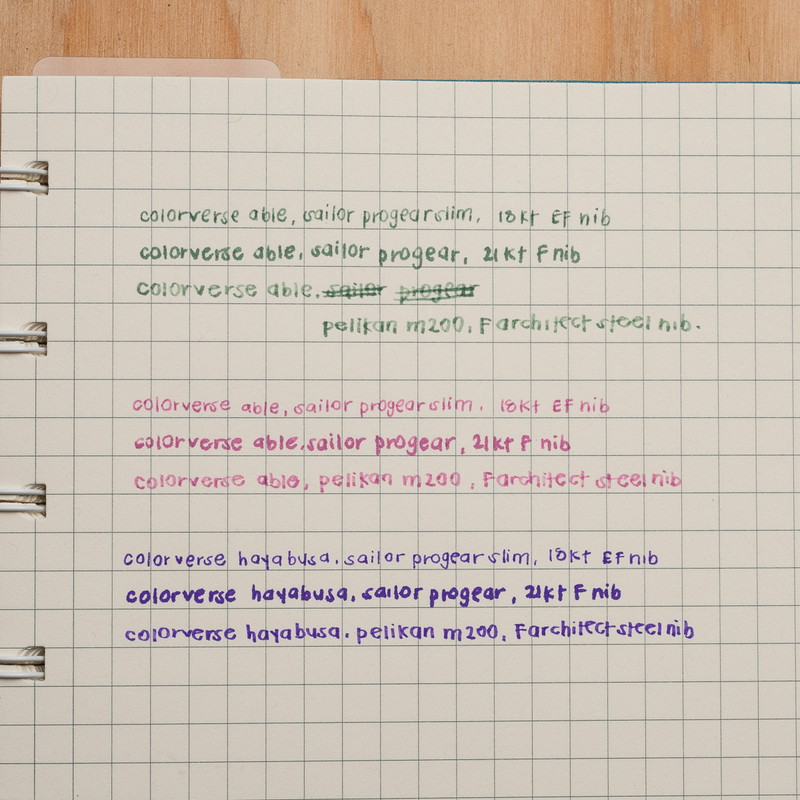 Franz: The bear paw… I mean, my hand wrote with the LB5 effortlessly in both posted or unposted modes. 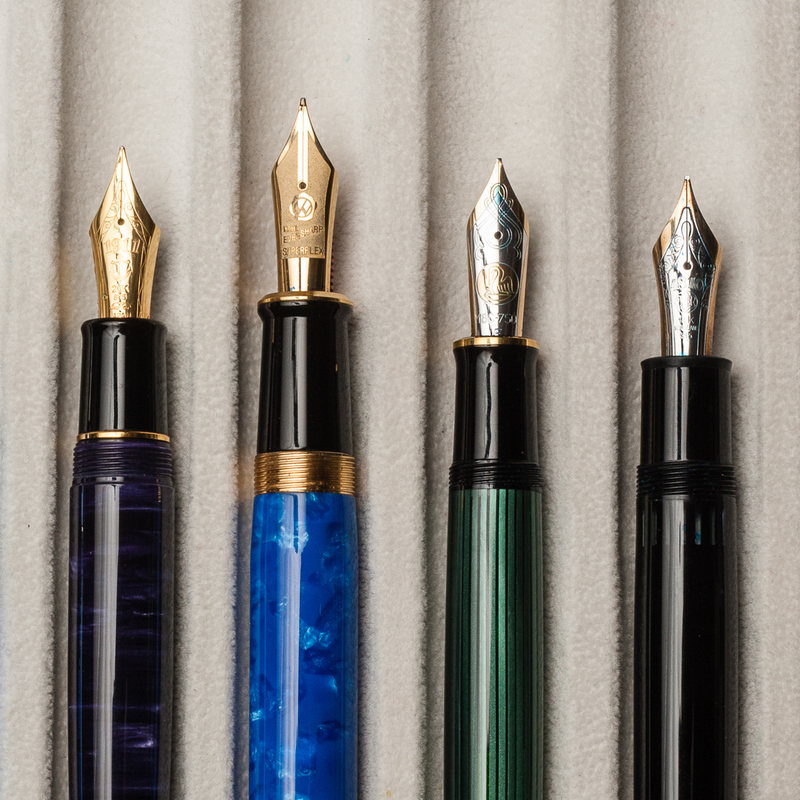 As mentioned earlier, the LB5 is 5mm longer than the “standard” Sailor King of Pen. 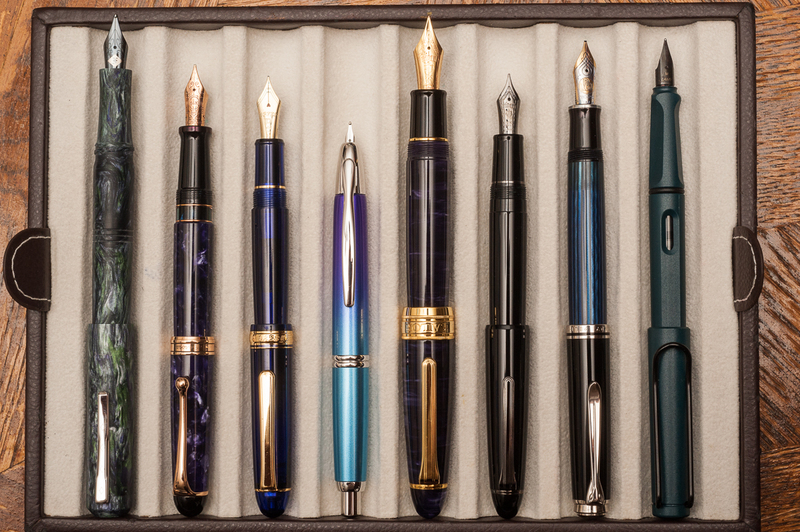 This is because Classic Pens requested Sailor to lengthen the barrel to make the pen more comfortable to write with when unposted. I truly appreciate the extra length of the barrel and was sufficient for my larger hands. 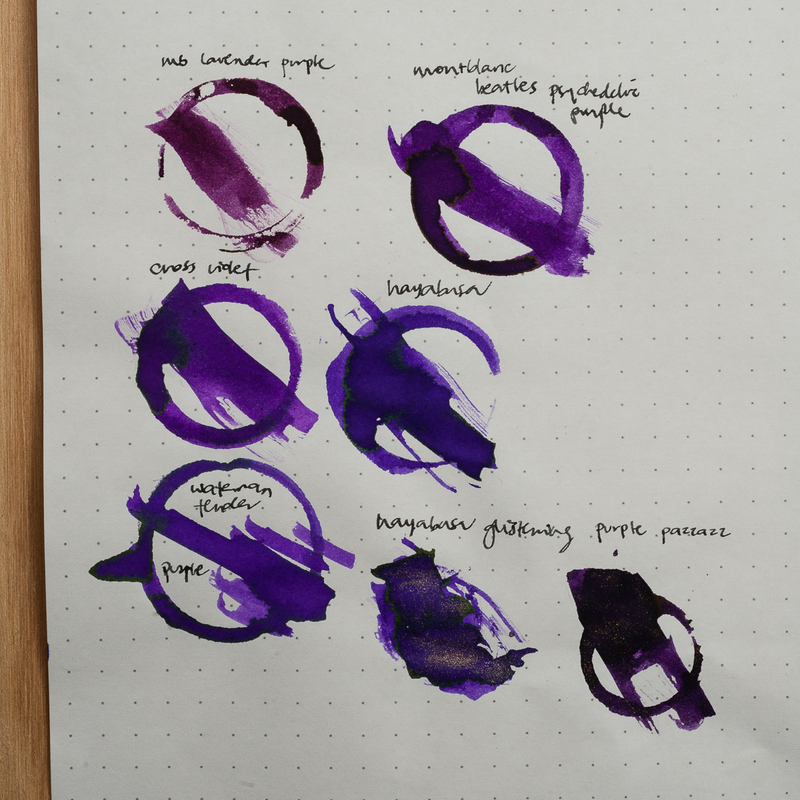 I do post the cap sometimes when i feel that I’d like the pen to be a little heavier and it was still a pleasant journaling session. Katherine: This pen is too large for me to EDC comfortably. 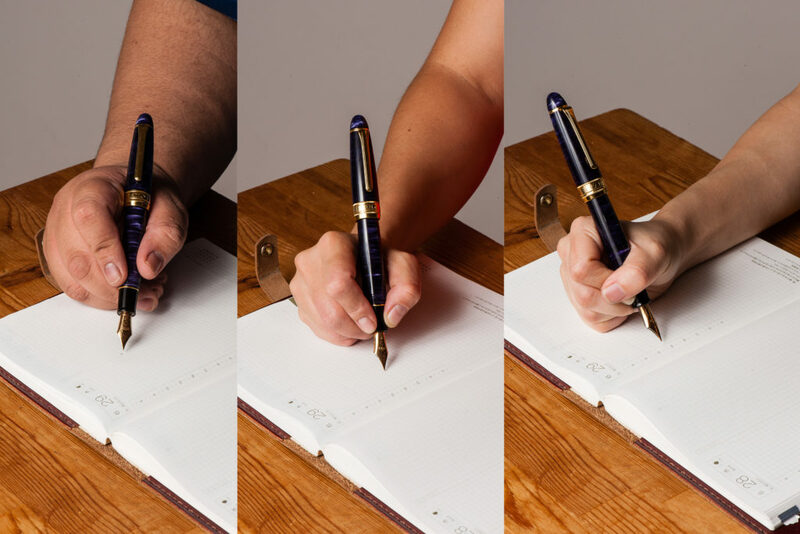 I tend to stick my pens in notebooks sandwiches, or occasionally in my jacket pockets… and this is just too big. It’s like having a hot dog in your pocket. But, if you have larger pockets than I do, it seems up to the task. Solidly made, and takes about 2.25 twists to uncap, so solid but not too tedious. Pam: This pen is a bit too large for my pockets, whitecoat or jeans. 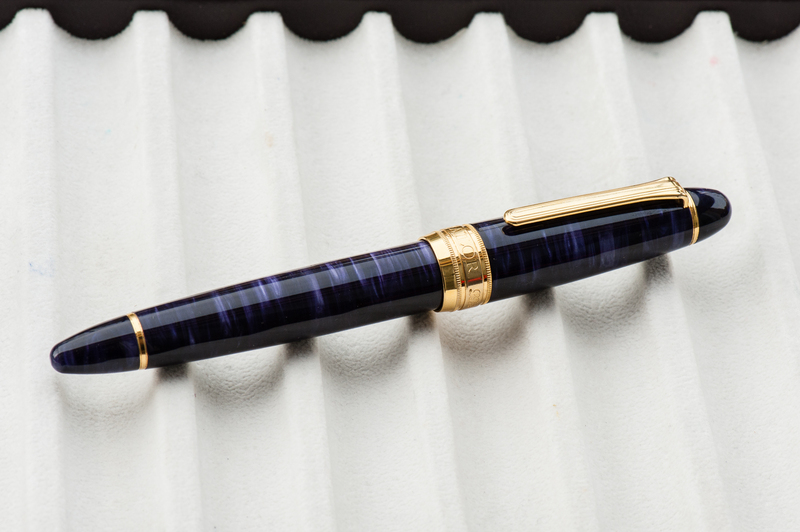 I would also not recommend being rough with this pen given that the material is so beautiful and may be scratched by keys. This beast will need a home in a case. 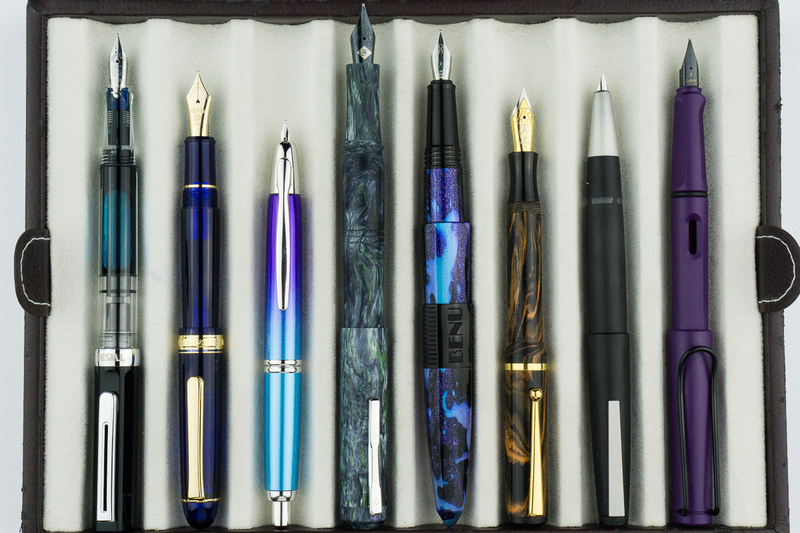 Franz: Is the LB5 a good pen for Every Day Carry use? Well, it could be. 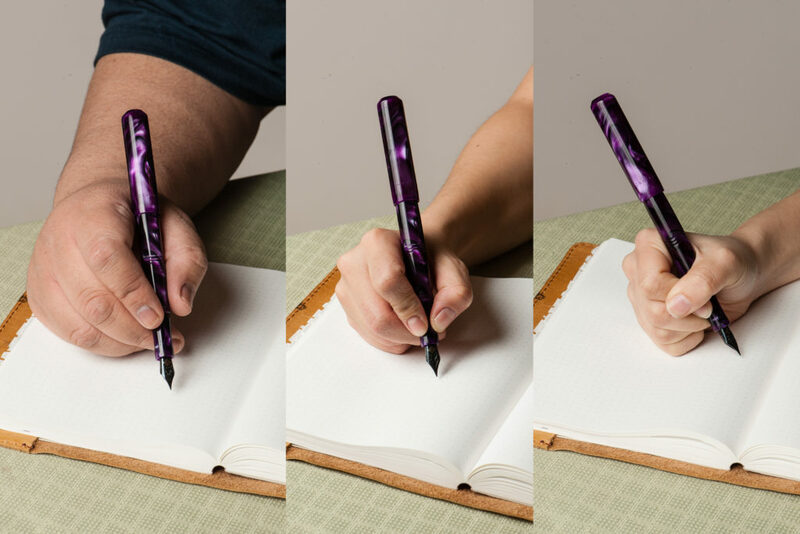 As detailed by the two ladies above, it is a larger pen to bring along. When I used this pen at work, I had to make sure that the dress shirt I was wearing had a deep breast pocket and even then, it still stuck out semi-securely. I am able to conceal and secure the LB5 when I constantly wear a suit jacket at work though. 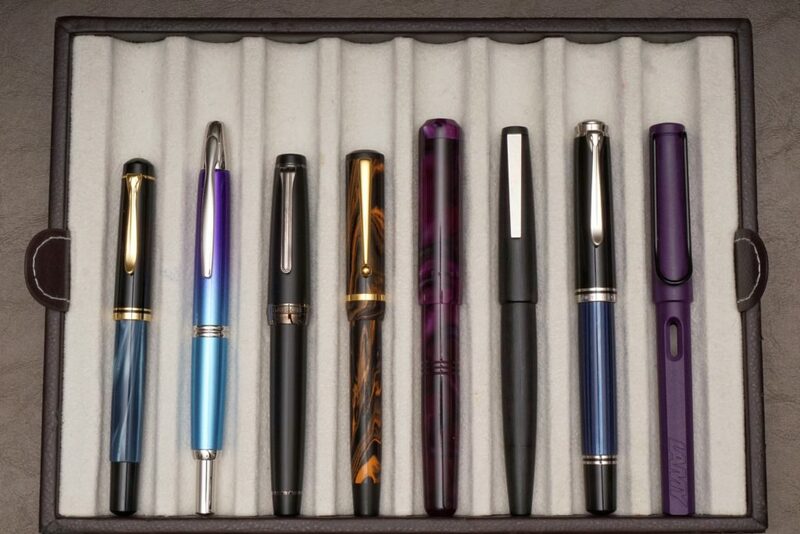 Now for carrying cases, it barely fit in my Nock Co. Sinclair case that I use on the daily. 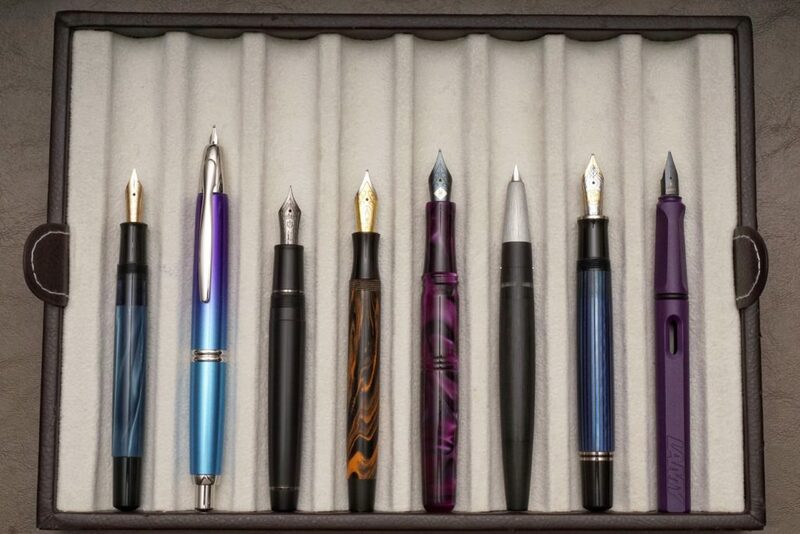 It does fit nicely inside my Franklin-Christoph Penvelope Six case and is quite secure in my bag. 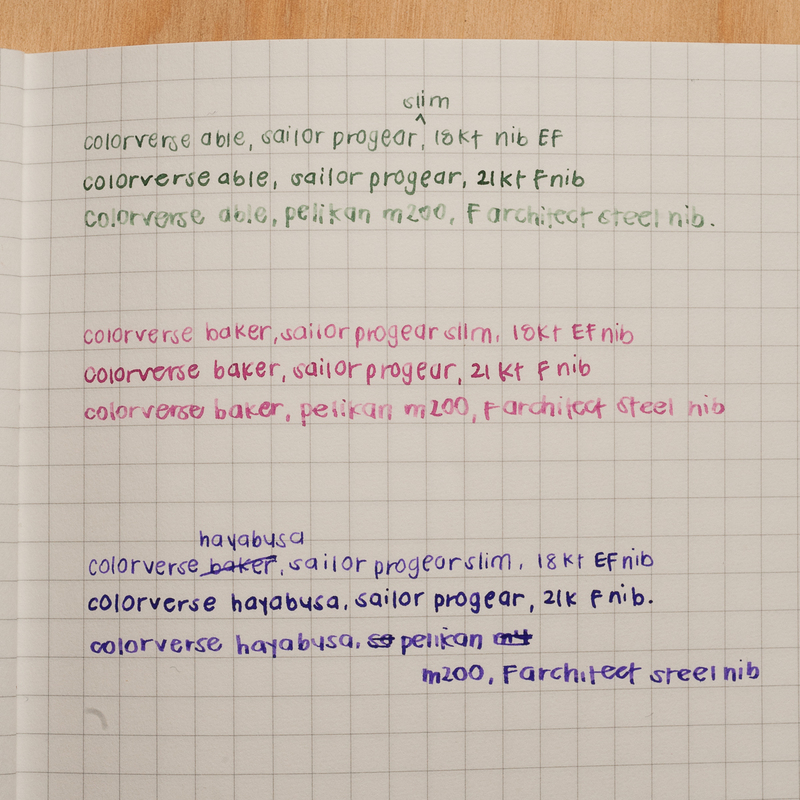 The broad nib is a little too wet for the cheap paper used at work but I believe a medium nib would be perfect. 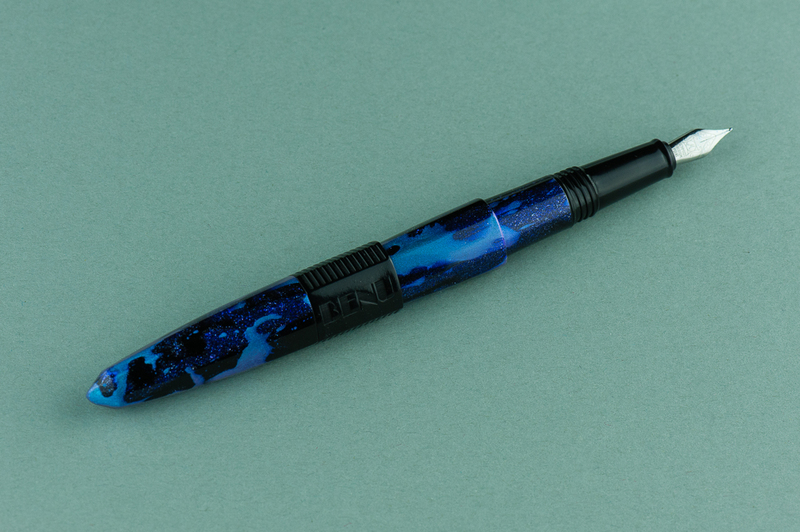 Just like most Sailor pens, it is a cartridge/converter filled pen so when I used this pen on the daily, I found that I needed to refill every three days or so. 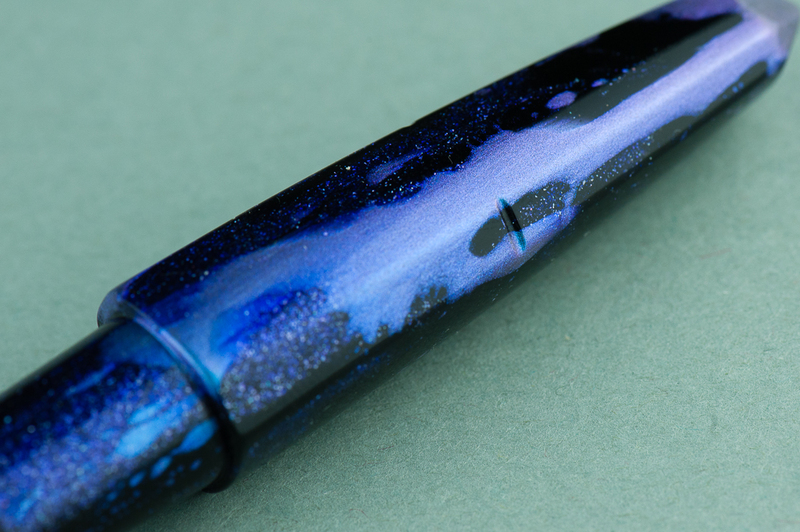 An advantage of the c/c filler is it makes the pen light weight instead of having a filling mechanism installed which potentially makes a pen heavier. 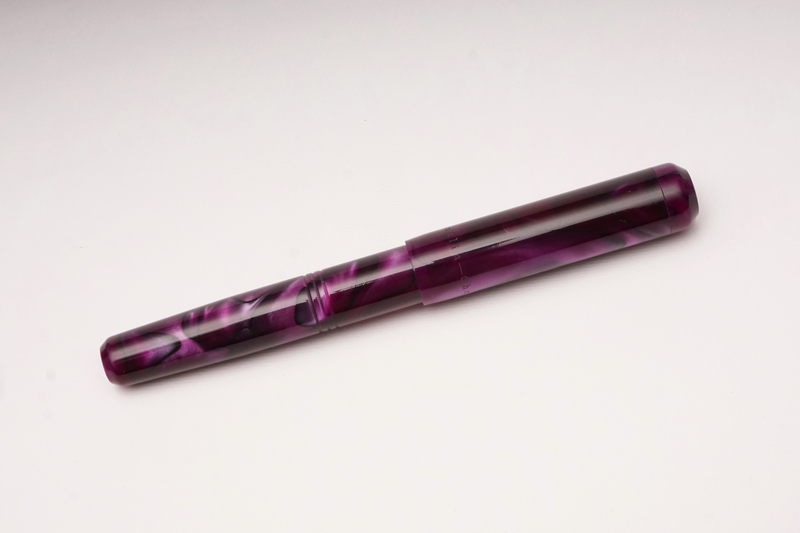 Katherine: I can see why this pen is a grail for many, but the size just means it doesn’t work for me. 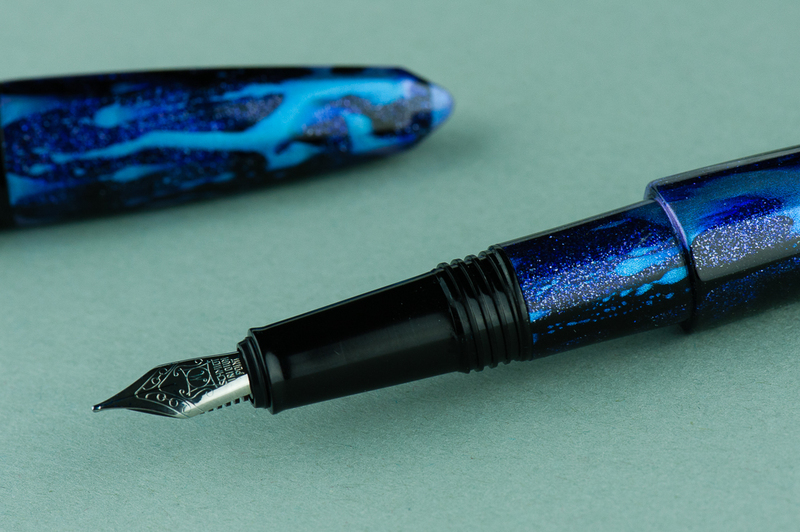 I wish pen makers wouldn’t only make their flagships massive… It’s gorgeous, has a fantastic nib and has a really unique material. 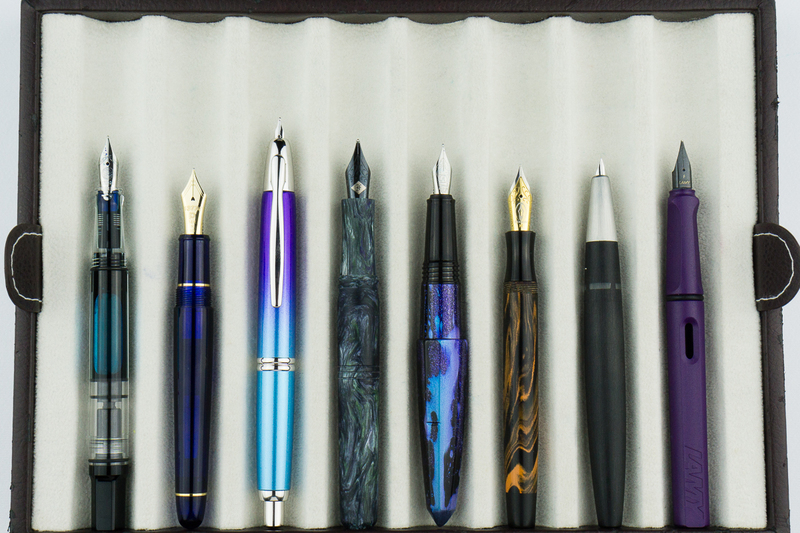 But, I prefer smaller pens. :/ Womp. 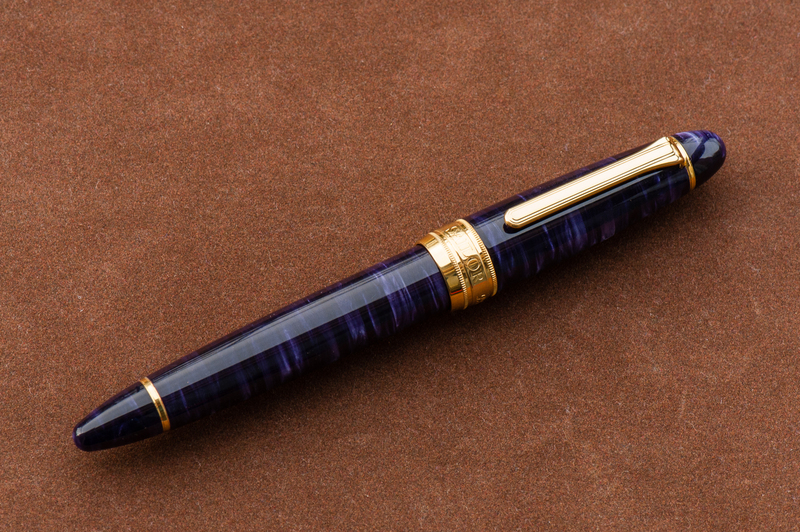 Franz: As we have noted in the beginning of this review, the Classic Pens LB5 has long been sold out. 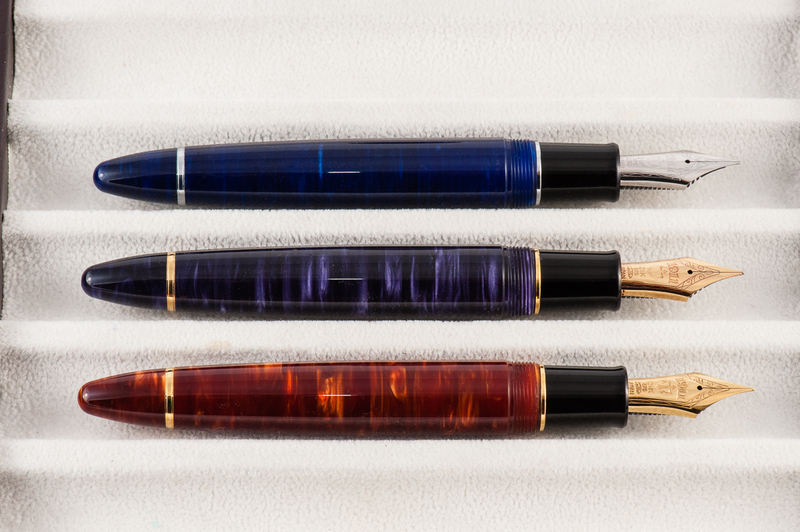 If you are interested in the pen’s unique diffusion bonded acrylic, Andy Lambrou currently has another edition of limited edition pens in these acrylics. 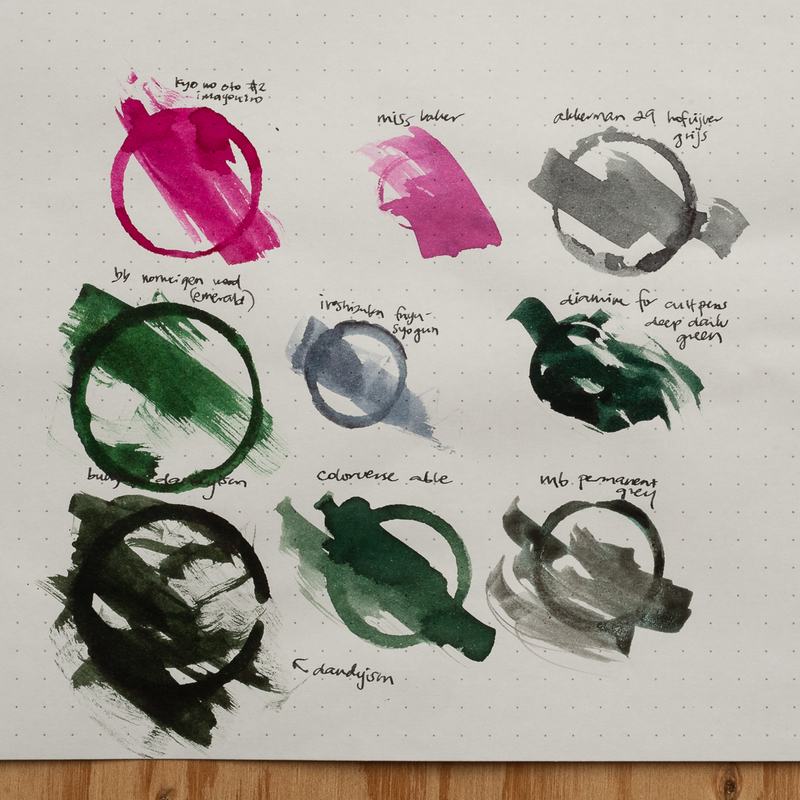 The Lambrou Pens LB6 Virtues is slowly being issued in seven different colors. 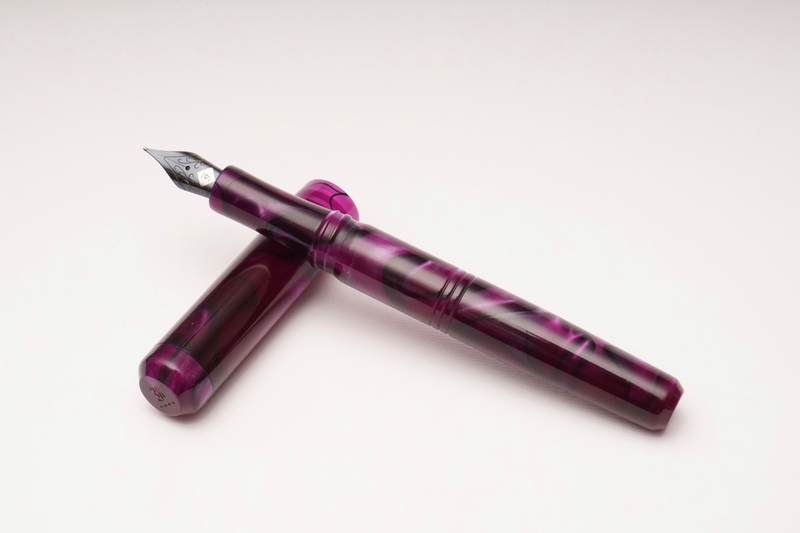 This edition however is more limited since they are releasing only 10 pens in each color. My final thoughts on the LB5? I am channeling the thoughts of the people who had reviewed the LB5 before (Dan Smith, SBRE Brown, Matt Armstrong, etc.) when I say that, I love this pen! 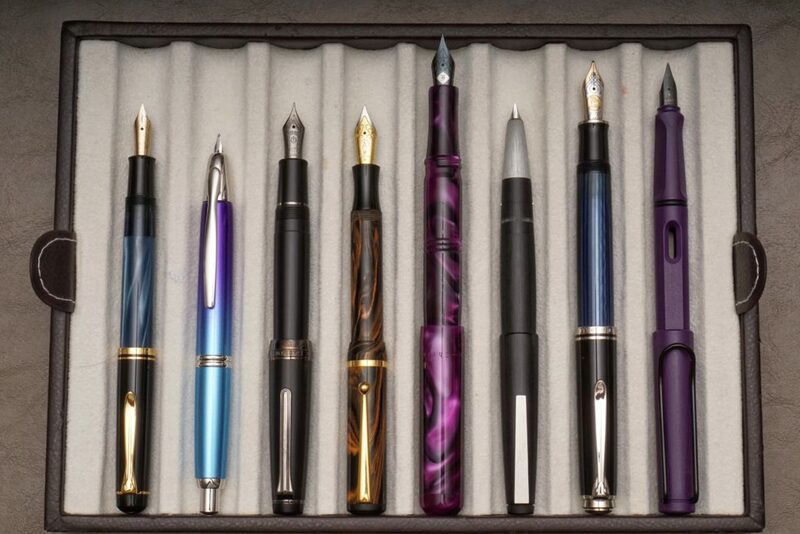 The Classic Pens LB5 has been a part of my Top 5 pens ever since I brought it home from the pen show. Why? Is it because: it’s a limited edition? the material? the pen size? the aesthetic? the value? 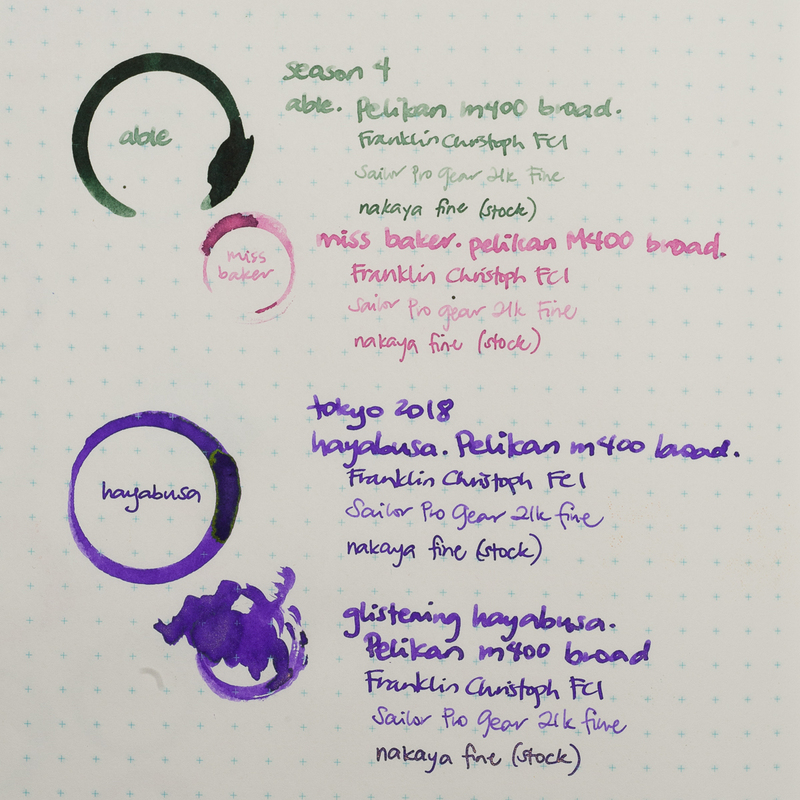 the connection I have with the pen maker? I can’t specifically answer why but I feel that it’s the whole package that the LB5 delivers.